Subject: Re:Highlording it up with Highlord Tamburlaine. 9/3 Aztecs, Natives, Bushi, Elves, and... Karnov? All the pieces are really well done- Bradigan Pitt is terrific, especially with your flamboyant build up! Use him wherever you can. The figure puts me a bit in mind of the character Skua September, from alan Dean Foster's sci-fi novel Mission to Moulikon (it's from the 70's, so no worries if you haven't heard of it). Skua is just like you describe this chap. Subject: Highlording it up with Highlord Tamburlaine. 9/3 Aztecs, Natives, Bushi, Elves, and... Karnov? Oh my God, you're right! That IS Brad Pitt Karnov! Now he just needs to pull a ladder out of his pants. Thanks for the link! That's the kinda stuff I need. I'll be sure to keep an eye on that link, as I know I have more PNW guys coming. I was sadly hitting up the 4th grade teachers I was at a conference with for some ideas on native clothing, since it's part of their curriculum. I knew about the woven bark but wasn't sure about the jewelry or some of the patterns on the clothes themselves. B.B. Pitt is, indeed, a work of art. You're work on the fur coat is superlative. Seriously, that Bloody Bradigan Pitt is an awesome figure. I did put too much work into that coat. There's at least three shades of brown in there as well as the base coat of german grey. Nagual, a MesoAmerican Wizard also from Paymaster's Going Native line. Reminds me of Mola Ram for some reason. 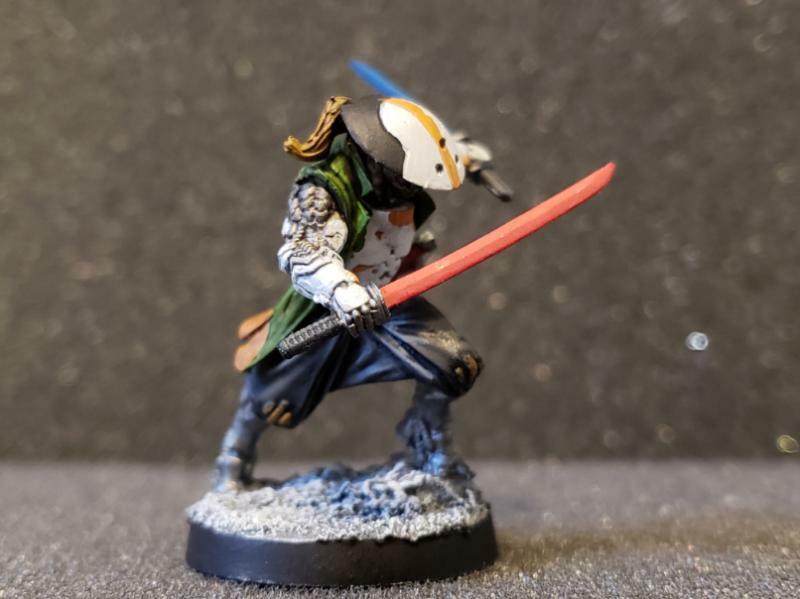 The first Shikami model from Infinity's Yu Jing faction. Can't go wrong with a wandering cybernetic samurai... although I think it might be the Miyamoto Musashi from Infinity in disguise. I gotta go back and fix up that wizard dude's magic. Nobody could tell it was supposed to be flames of some sort. This is their Imperial Wolfen Lord. At first I thought he was just a generic Space Wolf hero type, but no, he actually is supposed to be Wolfen. He's got shaggy sideburns, claws, fangs, and cybernetic doggy legs to go along with all his skulls! 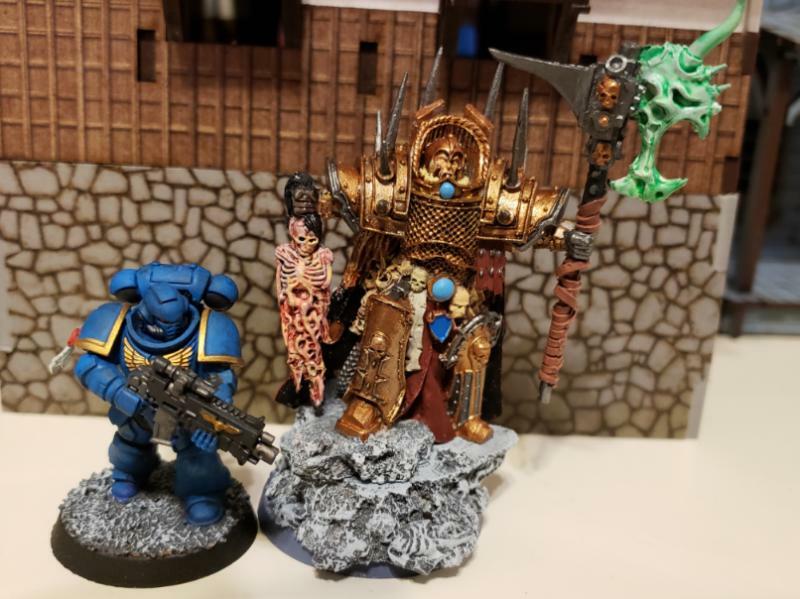 He's big, which meant he's easier to paint, but not too big, where he ends up Primarch size or something. As you can see, his base adds a bit of height, but nothing too ridiculous like some of the Hitech or Scibor resin ones. He'll fit in well with my Wolf squad I got for Kill Team, assuming I build and paint them any time soon. So... with that... how about something really random? This is a Skorn Warlord from the Warhammer Quest- inspired boardgame Darklight: Memento Mori. He's actually a boss character, and is represented by a token in the game. There was a boss mini pack available during the KS, which is where he comes from. I should've put someone next to him to give a size reference. He's a bit larger than a typical human. Barzam said he looks too much like Kratos, but that's how the KS art for his was! Do I have more random stuff than him though? Sure! My fighting hippo avatar! He's a Bones figure, with a mouseling for size! He's still a bit of a rough wip, but he's getting there! Next up, samurai and dragonborn! Subject: Re:Highlording it up with Highlord Tamburlaine. 9/10 Wolves, Lizards, and... hippos? 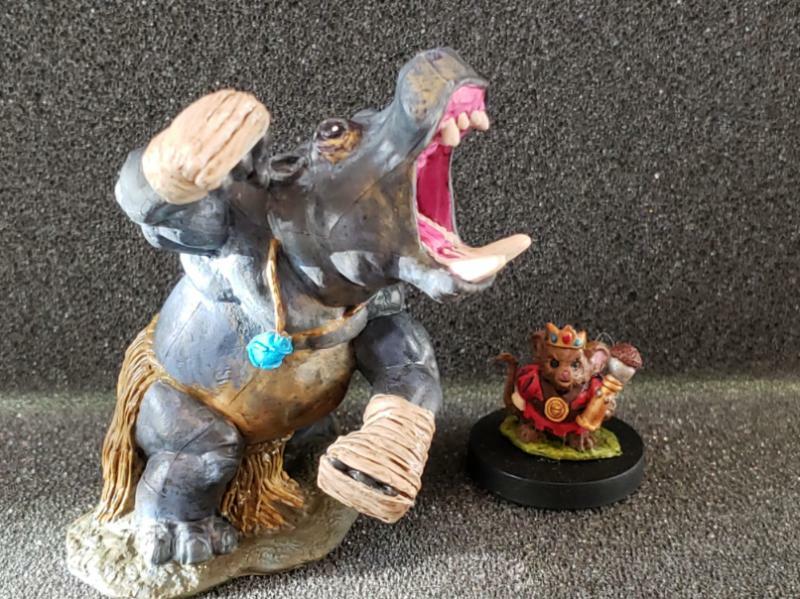 The fightin' hippo and mouse king are the perfect combination! Great work! Subject: Highlording it up with Highlord Tamburlaine. 9/10 Wolves, Lizards, and... hippos? The hippo looks like someone just gave him a nut shot. Space Wolf is neat, for what he his. 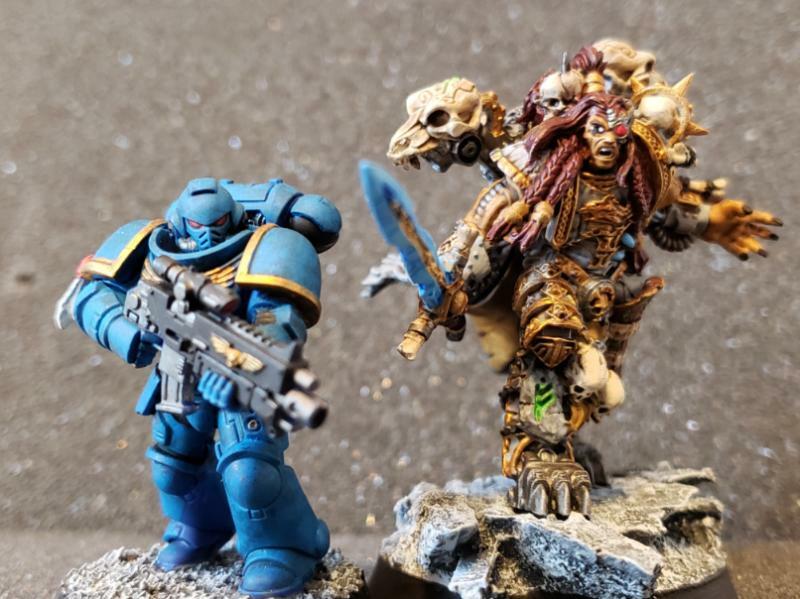 Too bad that like most Space Wolves, he ditched his helmet. So I've been on a bit of a Japanese kick lately. Doesn't help I keep spying the latest Taiga drama whenver my wife's got the TV on. 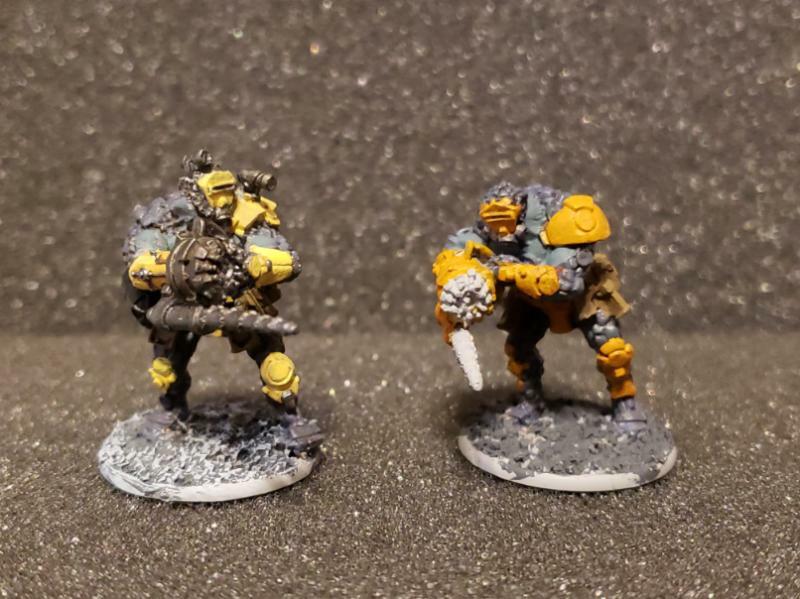 I picked up some Test of Honour figures at a reasonable price these last few weeks, and started working on my first set- Chobei's Renegades. The titular character Chobei is based on a historical figure, Banzuiin Chobei, who was supposed to be a Robin Hood type street tough in Edo that eventually got cut down living the thug life. While I haven't finished Chobei himself, I did finish up his street rabble. Seeing as how they aren't supposed to be actual retained soldiers or anything, I didn't bother putting swords or sashimono on them, seeing as how I doubt they'd own any of that fancy stuff. The long range guys as well. Forgive their lack of painted sandals and sloppy faces- both were touched up since the photo was taken. 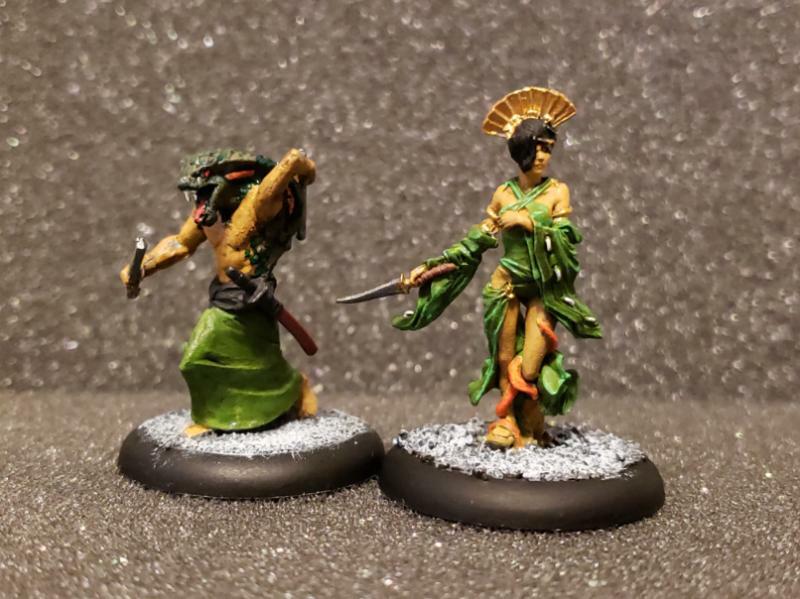 To go along with them, and coincidentally matching their colors, are the last two members of my Ito Clan for the Bushido game. I think the snake guy is supposed to be drumming on a taiko, judging by his arm position and the fact that he has weird club things in his hand. Would've been nice if they included a drum with him then! The girl will make a decent geisha type for Test of Honour or any other Japanese themed game we end up playing. I also dug this guy out this week and got back to work on him since he was first released. 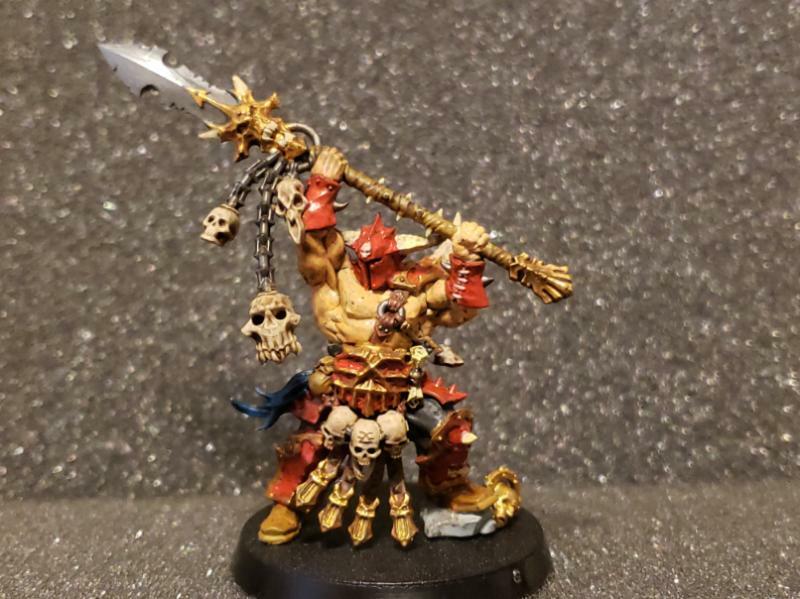 When he's done, I think I'll have painted every Age of Sigmar Khorne personality. Now to do something with them besides GORECHOSEN! 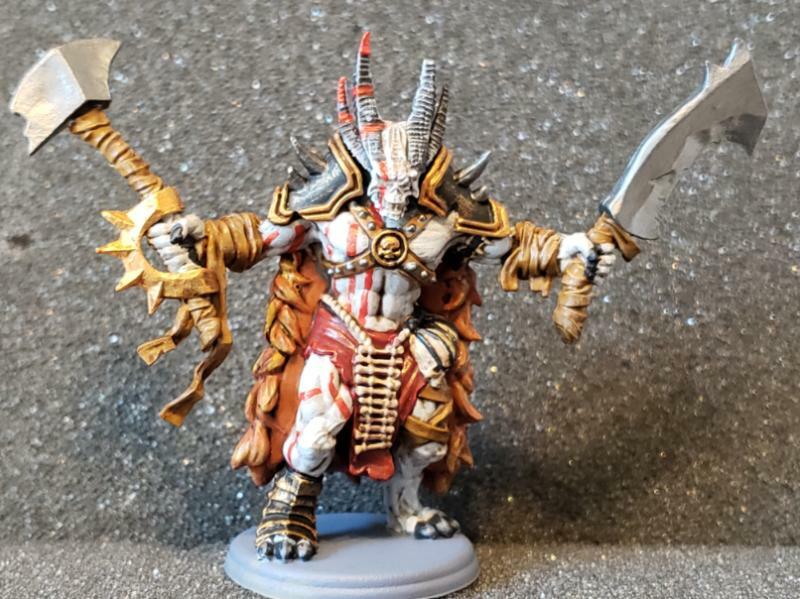 This is their Lord of Malice, and he's got all sorts of different paint patterns going on with him. Should I just continue with the red skin/ dark red- brown armored parts? Also trying to figure out how to proceed with some Gates of Antares Boromites. They're just started really, but should I go with the more pale yellow or mustard yellow for their armor? Lots of awesomeness in these pics. I was looking at Creaturecaster last night. I got a refund early in the cluster of Kickstarter. I really wanted the pincer demon and the mountain dragon. Would have ordered the mountain dragon last night, but they have since discontinued him . Oh well $100 saved there. As for the Boromites I’d go with the darker mustard color to really stand out from his skin tones. 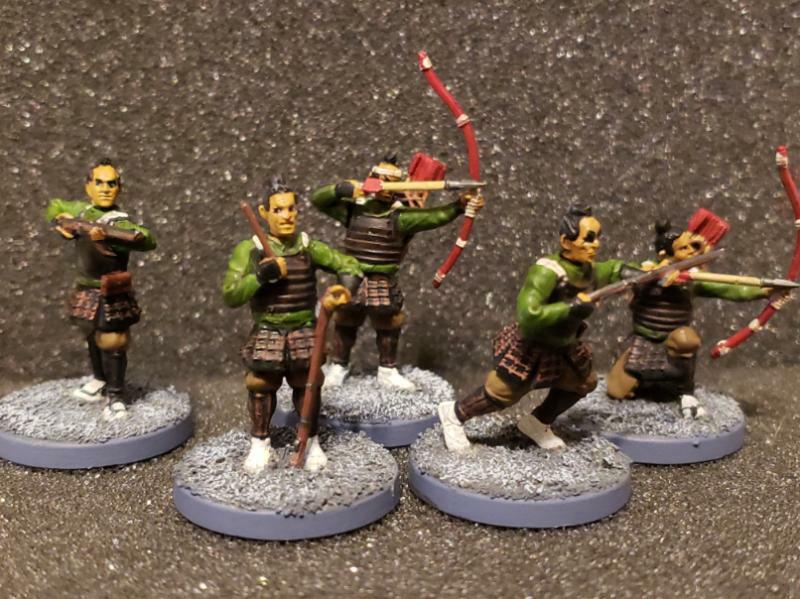 I have to finish my Ghar, Algoryn and Concord but the Boromites are growing on me........ .
Nice work on those ToH ashigaru. I particularly like the drab colors you used-- they don't look like retainers for a rich daimyo. I've resisted getting any ToH plastics, partially because I have so many metal samurai models already, and partially because they suffer from the same limitations that all multi-part plasics suffer from, namely that there are only a few poses that look realistic, so you're limited in how you can assemble them. Haven't had much painting time due to having to work with kids and get prepped for parent conferences and the end of the grading period. I did manage to squeeze in a few bits and pieces over the last few weeks. 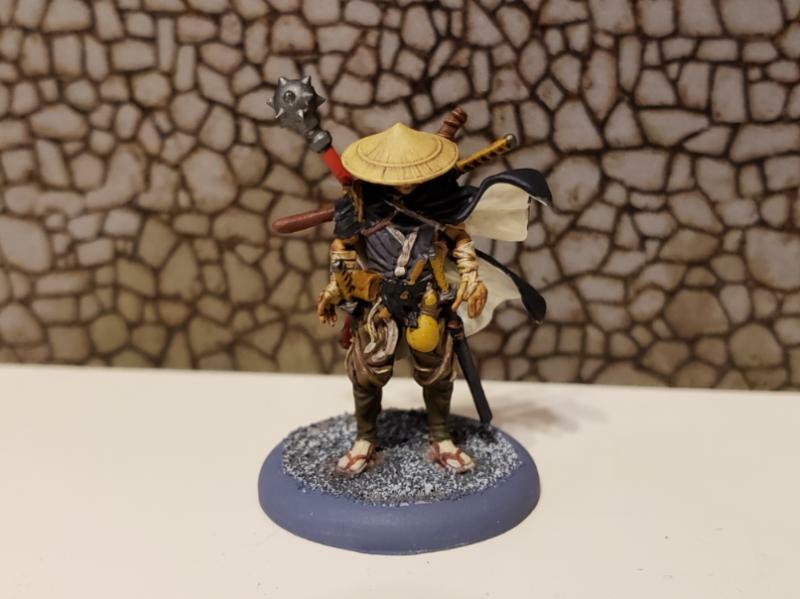 This is Toshiro, from GCT Studios' Bushido line. From my understanding he's a limited edition model that's only available during event weekends or at conventions. He's so laden down with weapons he seems the perfect player character for a mid- campaign Shadows of Brimstone hero. He's quite a busy looking model though! 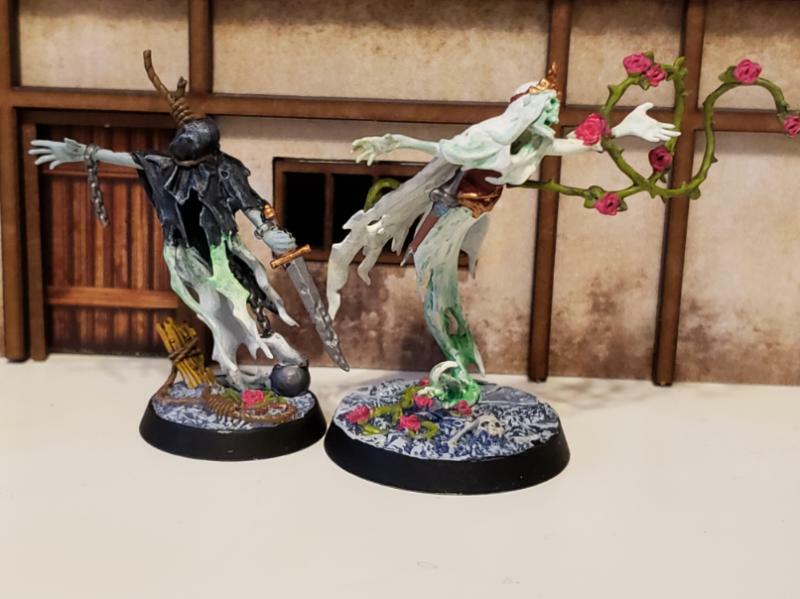 Toshiro is joined by Chobei from Warlord's Test of Honour. He's a metal figure as opposed to the regurgitated Wargames Factory samurai. One thing I'll say, the metals have a lot of character to them. I think I ended up picking up most of the metal character models. 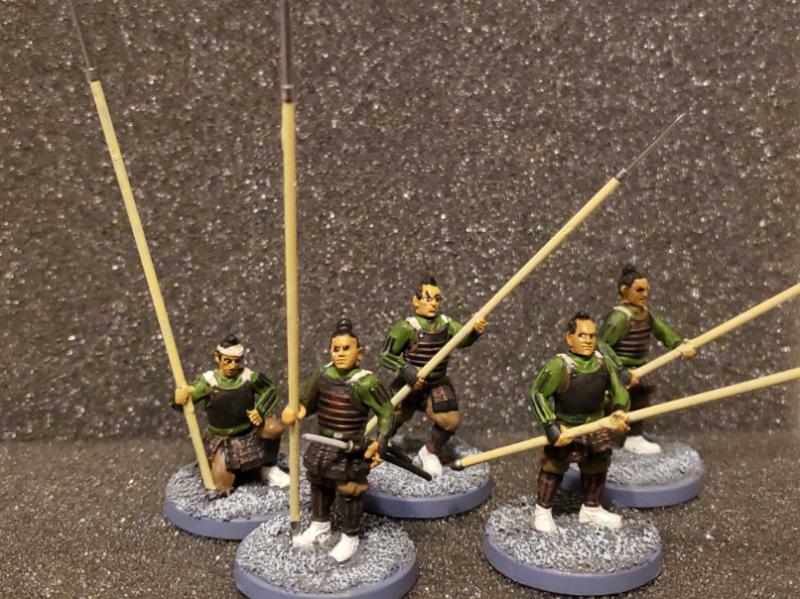 Now to get some more ashigaru and samurai painted up to hang out with them. The terrain behind them has been another item I've been working on slowly. 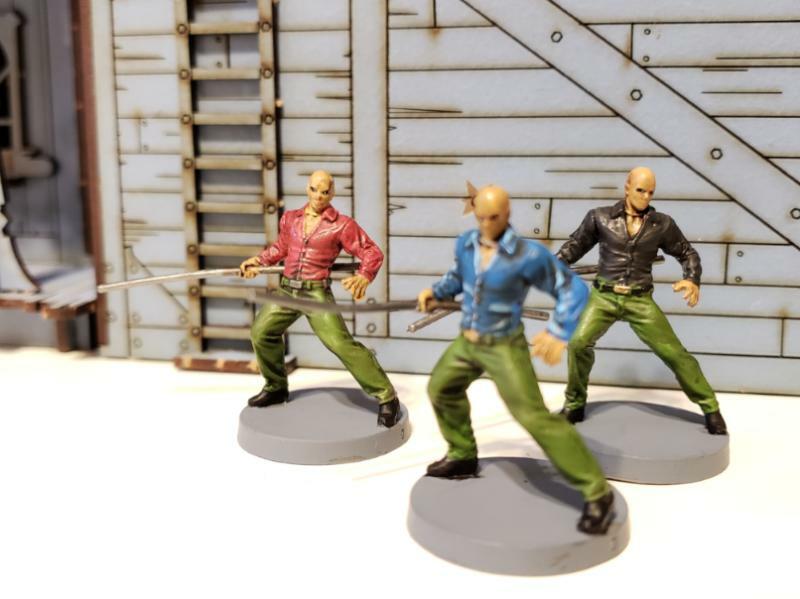 It's all Plast Craft's Fukei line for the Kensei game. It's an interesting mix of material- plasticard, foam, and MDF wood. I particularly like the houses with their support frames around them. Still irritated they don't really allow the figures to use the interiors of the buildings. Those chainrasps should be the last batch I had left from the Soul Wars box. 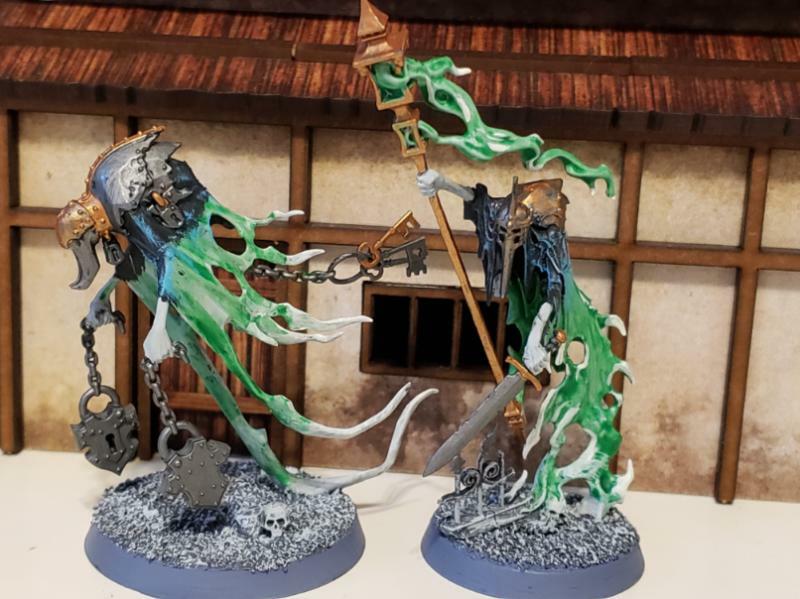 Now to move on to the bigger and more exciting Nighthaunt models! I also finished up a fairly large Poxwalker pile. I don't think any of them match paint- wise. I tried to make them all a bit different. Sadly there's still more after these guys. I might try clipping and smoothing some of the horns on the next batch just to make them even more visually distinct. I was currently working on Astorath the Grim, along with the WGE Mephiston proxy, but I broke Astorath's axe and can't find a replacement I'm happy with. Mephiston stalled out as I can't find a red I'm happy with. I guess it's time to hit the shops to find some decent alternatives! That Toshiro is fantastic! What a great figure and you've really done justice painting him up- really nice job! You could pair him with the other figure in the straw 'coolie style' hat and they could be Destiny and Death from the Kung Fu Hustle movie! 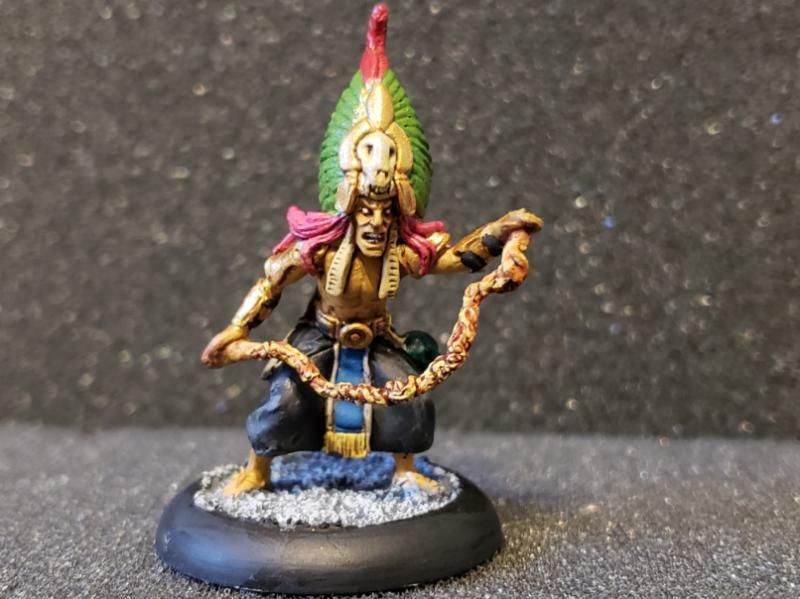 If I'm going to be painting big wide brimmed straw hat guys, I'm going to have to take of my Kensei assassin who's sitting here waiting to get primed, along with three or four dozen other figures. 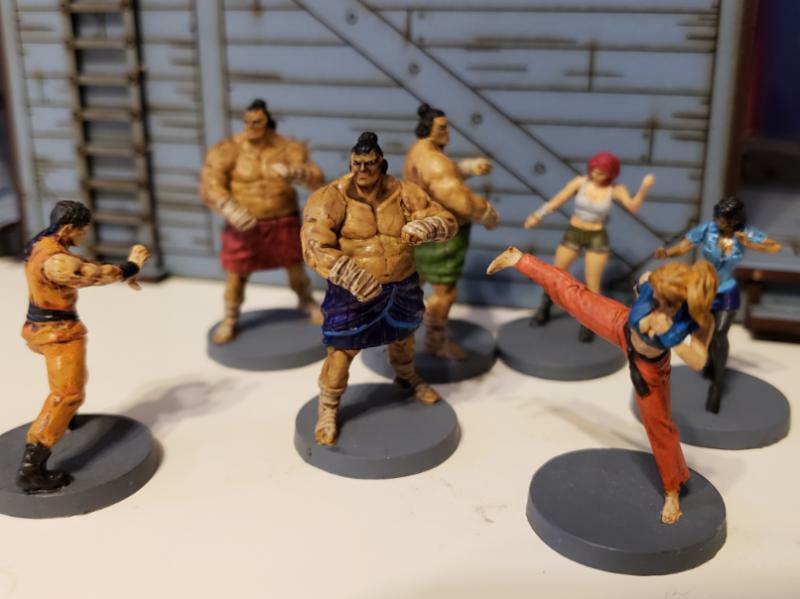 Plus, before we'd do a Death & Destiny figure, we gotta take care of the Three Thunders from Big Trouble in Little China (but those guys are pretty much already in the new Shadows of Brimstone game, so hopefully that'll be soon). At least I've cleared some space for those soon to be primed figures. This guy has been eating up a bunch of real estate on my table, along with livestock. This is Golgog Goat- Eater from Mierce's Darklands line. 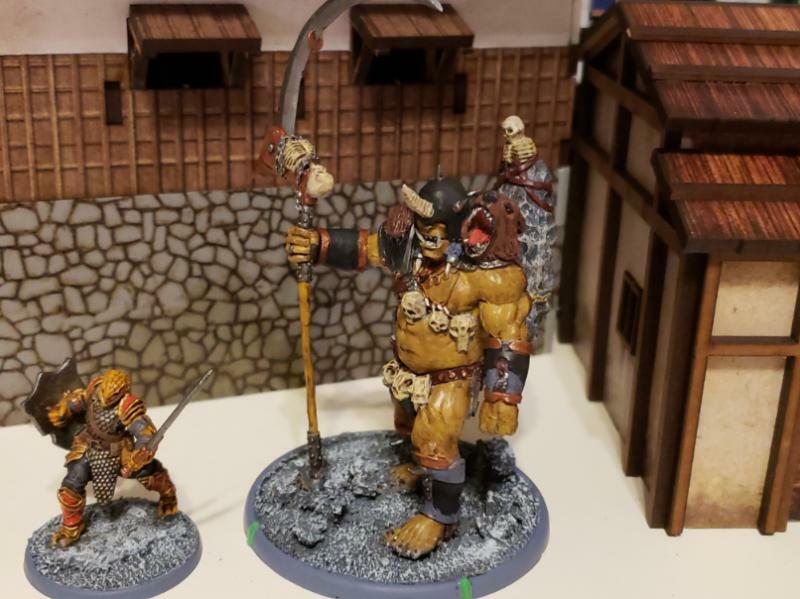 He was an ogre mercenary, or Oghur to be more appropriate, and he's quite big as that WizKids Dragonborn is a bit larger than an average human and is on a 32mm base. He's a big dude. I was really taken by his original artwork, as he looked a lot more vicious and feral. The final sculpt is nice, but doesn't have the energy I felt the artwork had. I love how laden down he is, despite it not coming through in the photo. He's got 3 goats hanging off him, some birds, pouches, a huge blade, assorted hooks and chains... it's *almost* at Rackham levels of provisions hanging off of him. Almost. As far as I can tell, this is the first painted photo I've seen of him. Believe me, I looked. 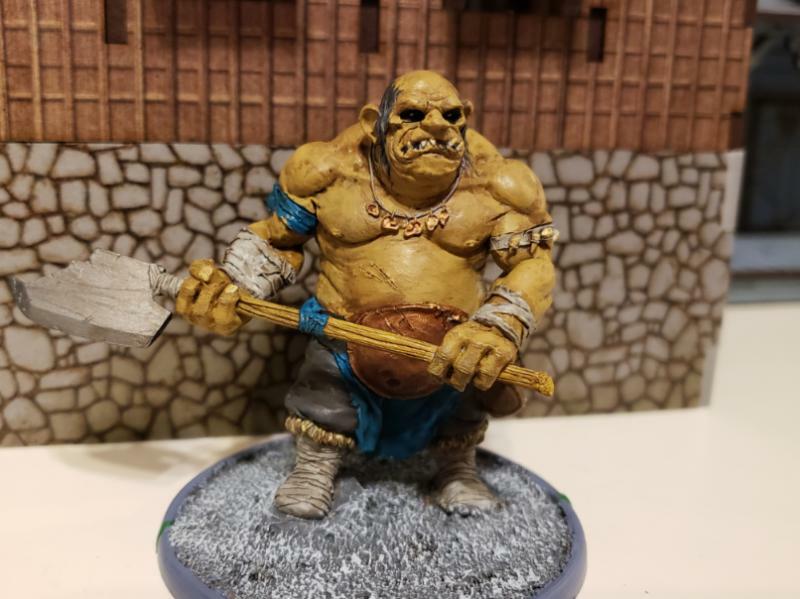 More surprising is that I didn't end up painting him with red skin like most of my ogres. I think that yellowish brown ocher works well for his base skin tone. All of my Ogres/ Oghur are getting painted up in Fomorian colors for Darklands, despite what kindred they belong to. I wish his big wyrd stone or whatever he's carrying had more runes carved into it. Didn't help that they were hard to discern from the patterns in the rock's texture. He's also a pretty big dude. His head reaches the roof of that lord's house next to him. 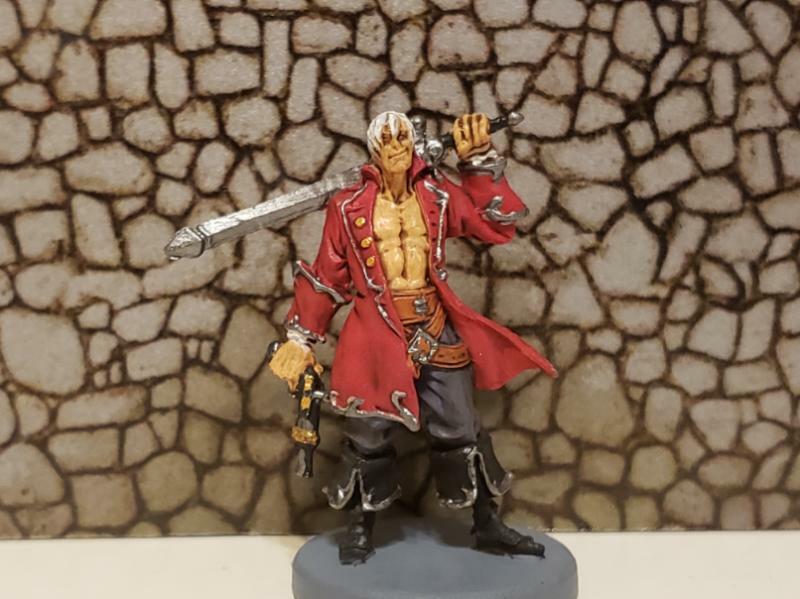 Another figure I've started off and on since his release is the Visarch, Sword of Ynnead. I think I've got him to a point where I'm pretty happy with him. Now it's a matter of studying up on white dwarf articles on how to paint gemstones to finish up all his soul stones and sword. I guess I'll try freehanding the symbol that's supposed to go on his loincloth. He's currently being mobbed by a group of Shadows of Brimstone Werewolves. I've pulled out a bunch of my SoB figures in an attempt to get more finished prior to Forbidden Fortress arriving. Wolves are done enough, along with some of those two headed rat thingees I forgot the names of. Painting the wolves up first is not the wisest choice, as they hit HARD. They are not enemies to be trifled with at low levels of the game. Next up are the vampires, as they're pretty easy to paint up. Currently working on the Chainrasp team for the new Shadespire box set while I work on the vampires, as they share a lot of base colors. Subject: Highlording it up with Highlord Tamburlaine. 10/4 Visarch and a return to Darklands! The Red Eldar is excellent! Are you doing to do anything with the sword? 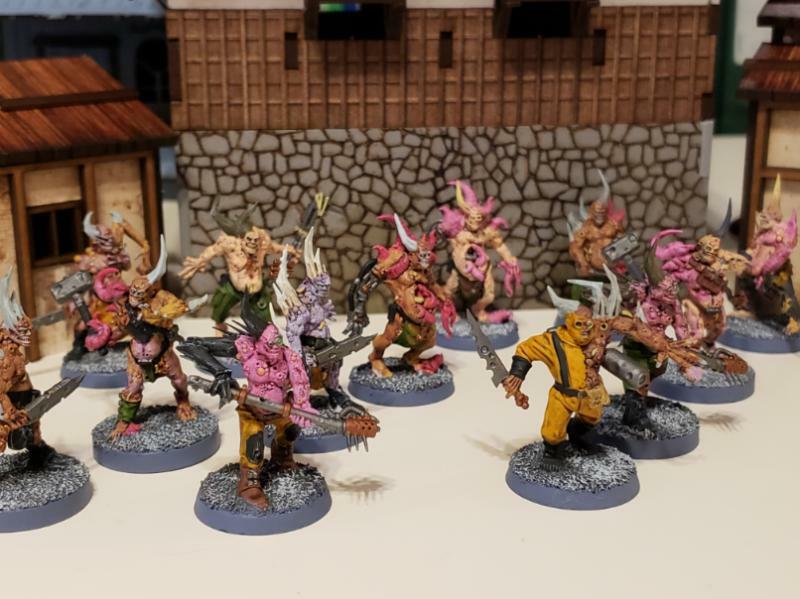 The new ogre flesh tone looks really good. The red visarch looks pretty sweet, although I want to see those sword and gemstones finished. The SoB werewolves look like my favorite type of werewolves, and werewolves are my lizardmen. Why haven't they gone up for sale on Amazon? How much detail do the plastic kits carry? Subject: Re:Highlording it up with Highlord Tamburlaine. 10/4 Visarch and a return to Darklands! I thought the plastic wolves were decent. You can pick out things like teeth and claws, and the fur is pretty thick in spots so it's not too hard to highlight. They're currently available on the Frog's website for their Halloween sale, along with a bunch of other interesting stuff. Plus the usual buy 2 get 1 free card expansions. I splurged and grabbed the magma giant since it was available as a preview. No idea how I'll paint it. Gotta do my lavamen as it is, and my Brimstone painting cue is starting to get rather long... at least my vampires should be done shortly. Time to finish (or get finished) a bunch of items that are cluttering my workspace! 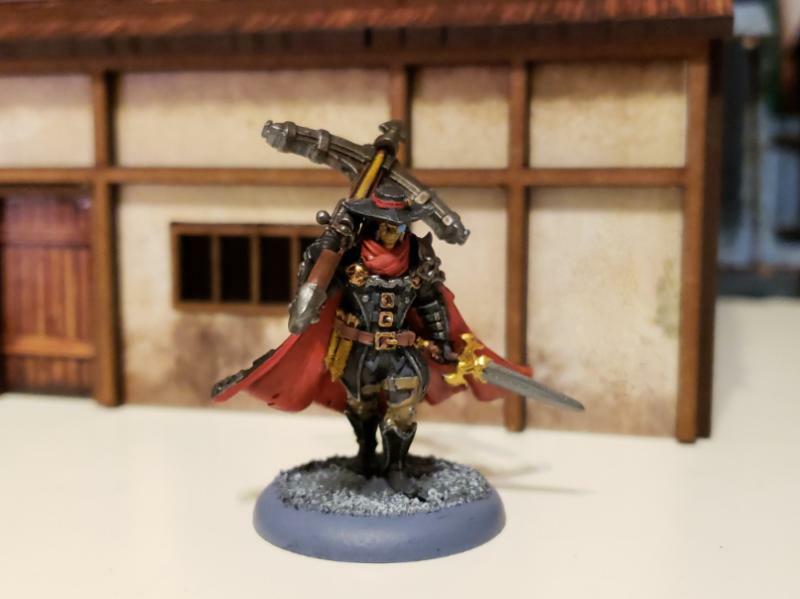 Alten Van Helsing, a reimagining of Alten Ashley from the Mercenaries subfaction for Warmachine. He's from Privateer's Minicrate line. Thankfully I found him at a reasonable price- he's been one of the more expensive guys to acquire after market. Love his ridiculous ballista crossbow. I had some SoBrimstone Vamps for him to hunt, but I forgot to photograph them. 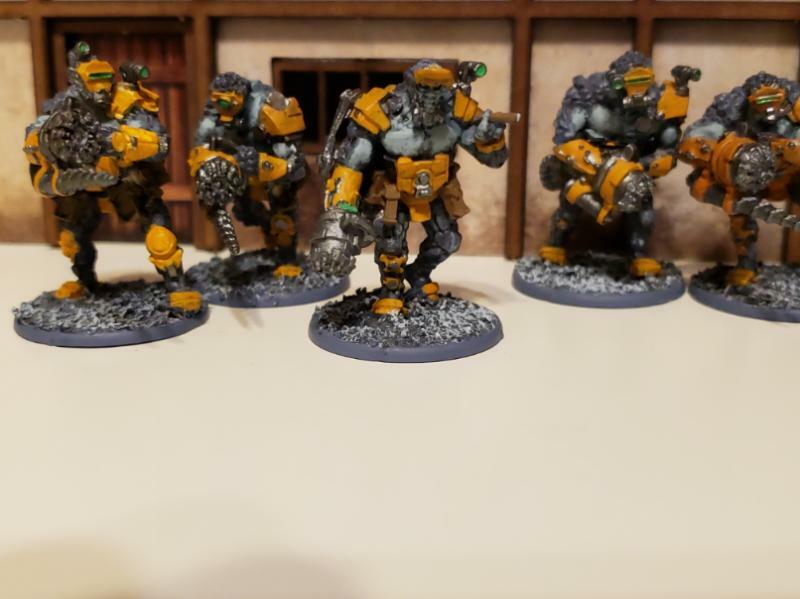 My completed Boromite Work Gang. These guys are equipped with heavy tractor mauls, whatever those are. Love the boss with his cigar. 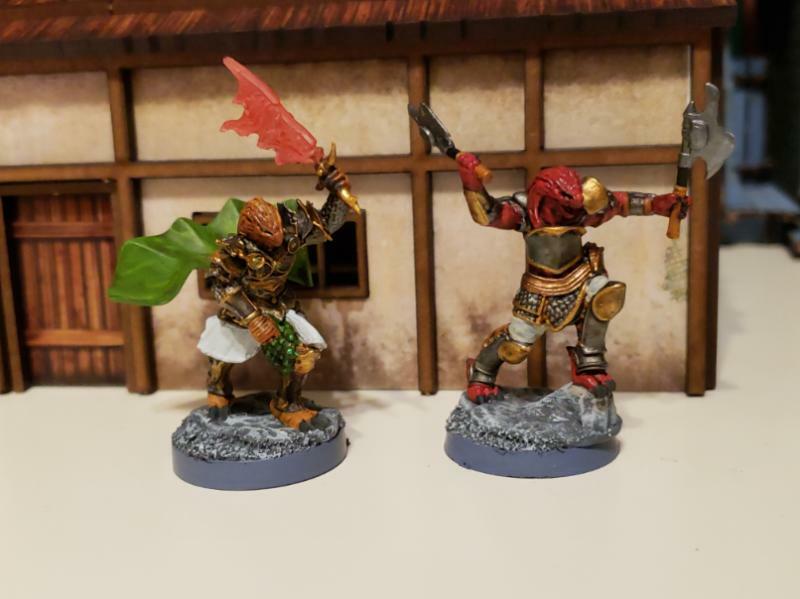 Some WizKids Dragonborn I finished up recently. 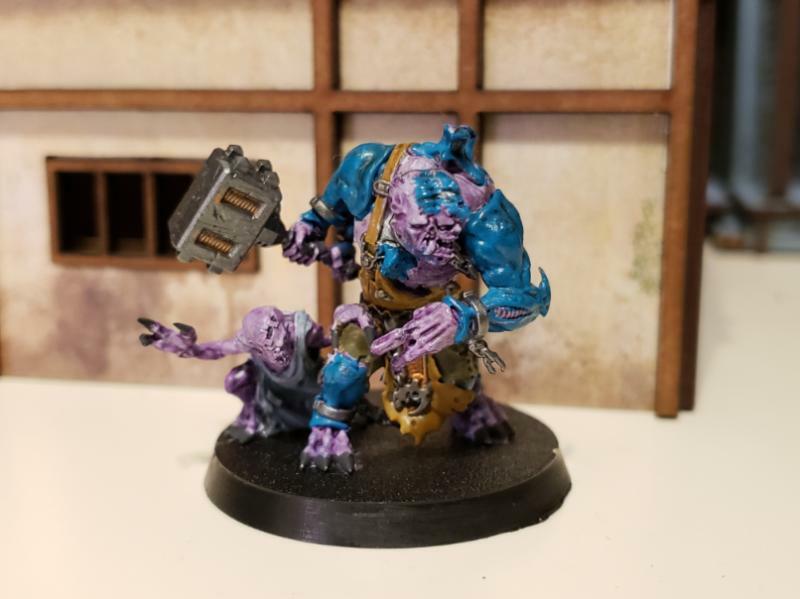 The Genestealer Cult Abominant from the Tooth & Claw box. I didn't get the box, just the cult members. Should have him done and based soon enough. I had a hard time getting him to fit together. His legs were quite uncooperative. I made a bit of a mess with the glue, but thankfully it's all covered up and nobody will know... until I post this at least! Still need to add quite a bit of details to him, and finish up his little buddy there. 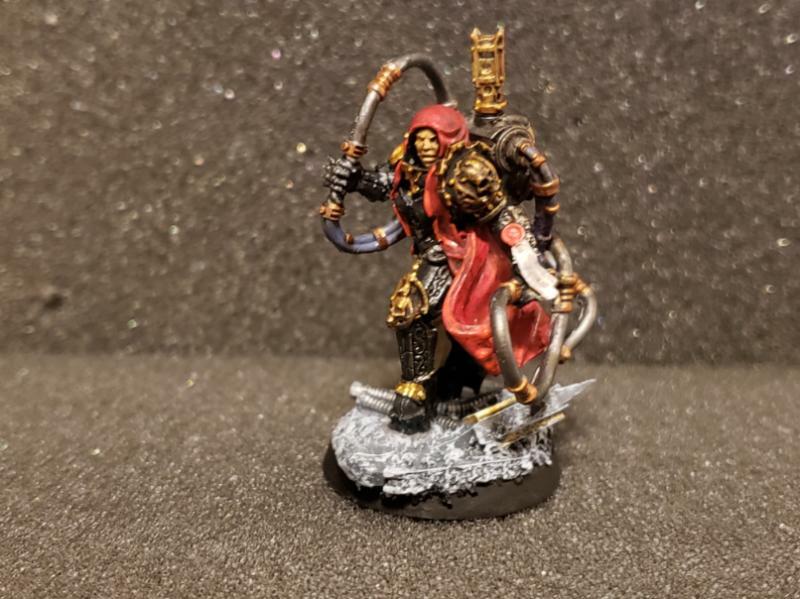 Got that Lord of Malice finished up! 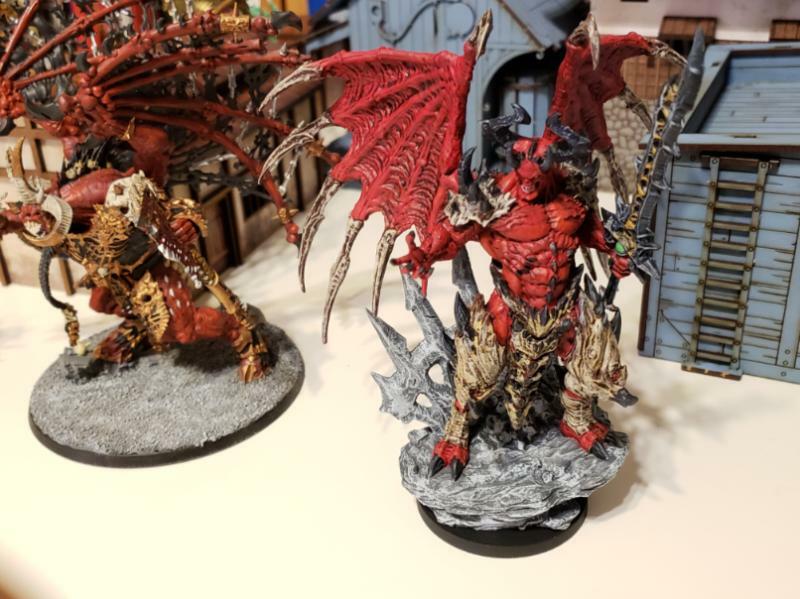 That's Gw's plastic Skarbrand next to him for reference. Almost as tall, about half as wide, and half the price as well! Another cool thing is his base actually is on either a 50 or 60mm round. I love how Creature Caster's figures are deigned to fit on a small footprint but expand vertically for presence. That way he can get mobbed (or defended) by lots of chaff! And with that, yet another chunky figure finished! Traditionally those spikes on his tail aren't supposed to be painted that way, but I didn't care. It was just too red and needed something to break up the monotony of it, despite being made with a multitude of red paints. 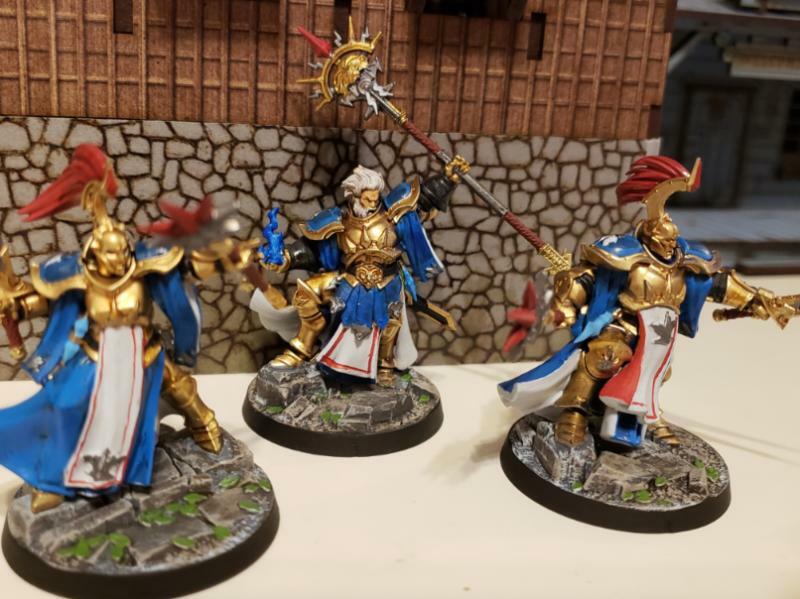 The gang all back together, waiting for me to finish the new Stormcast team so we can try a magic heavy game! Speaking of Nighthaunts, it was high time for me to get the rest of the Soul Wars box finished. Two of the hero models who's names I can't remember. The Lord Executioner. 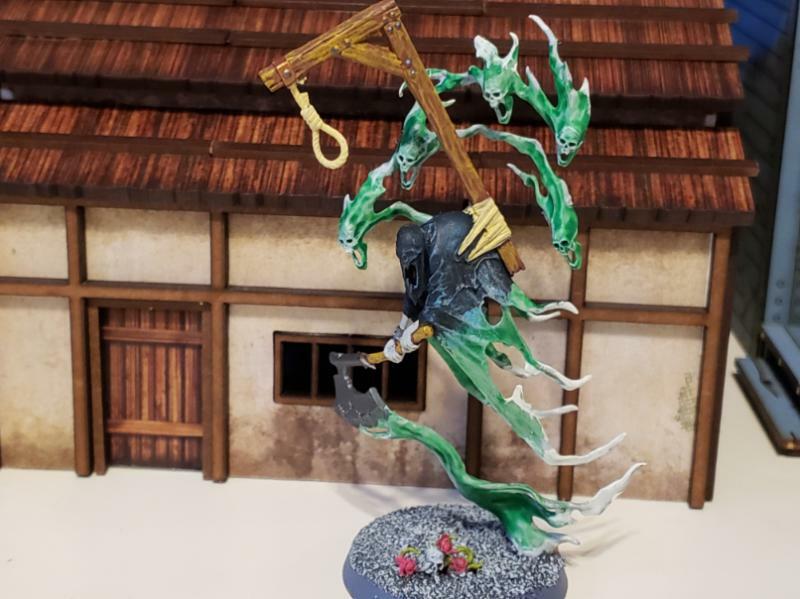 With him done it's just the guys with scythes and the knight on the horse, and all the Nighthaunts are complete. Also been working on a few Wild West Exodus figures. I want to say this giant werebear is Geronimo. I need to finish up his jewelry but his fur is done at least. 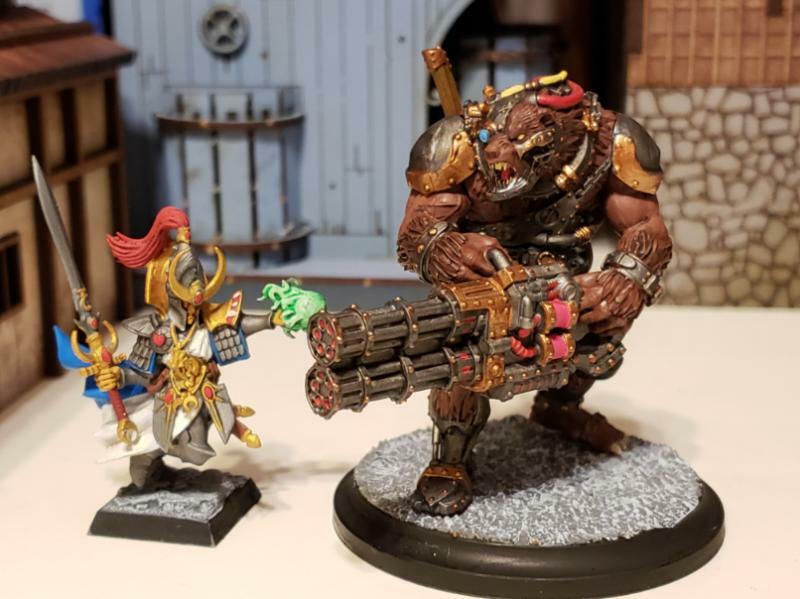 My giant steampunk augmented evil werebear with a gatling gun. How many games can attest to having a figure like that? Not many! 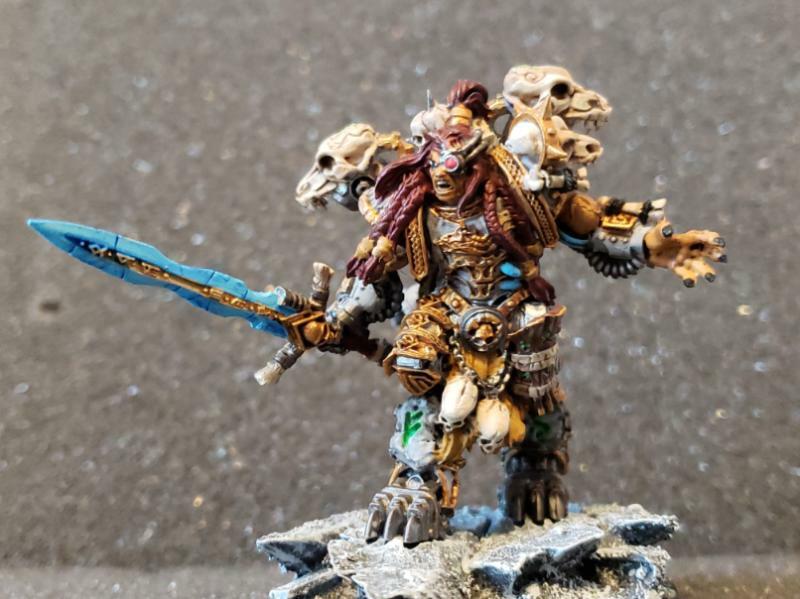 I don't have his WWX rules, but I have a feeling he'll see play in some post apocalyptic games. Maybe a standin super mutant in fallout? 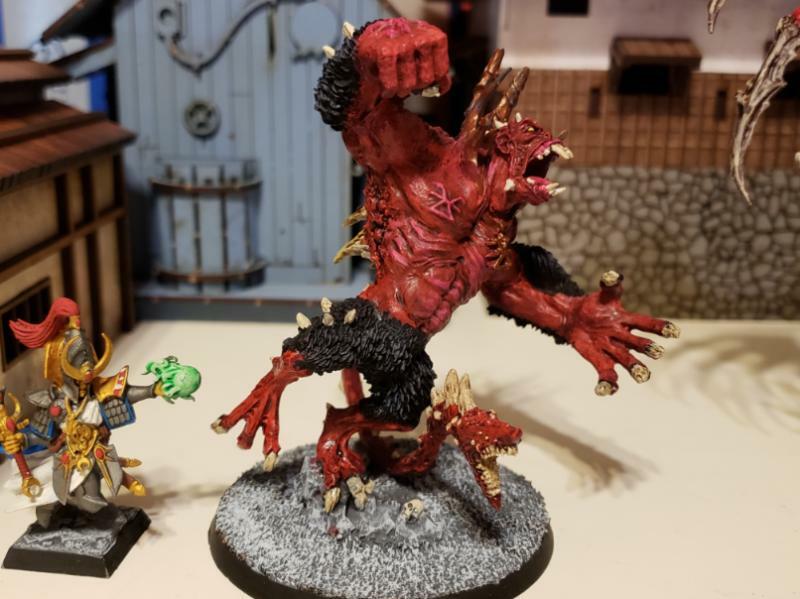 Some of my upcoming projects to work on- I didn't realize just how large that Magma giant from Shadows of Brimstone was going to end up being! Subject: Highlording it up with Highlord Tamburlaine. 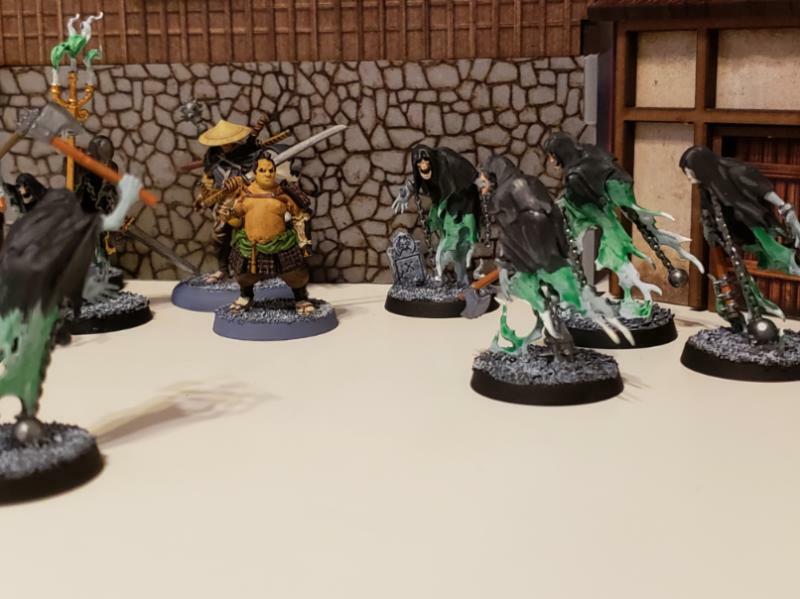 10/16 Daemons and ghosts and werebears... oh my! 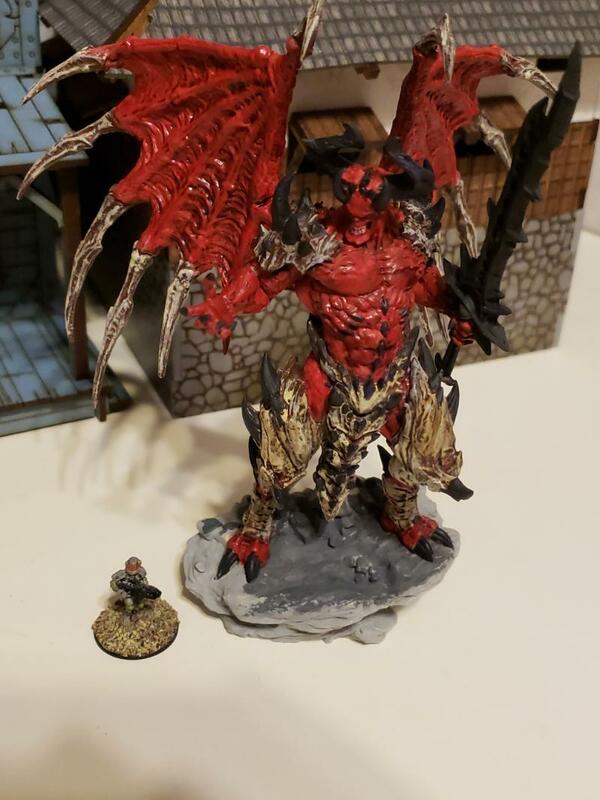 The Lord of Malice turned out good. Are you actually going to keep him? 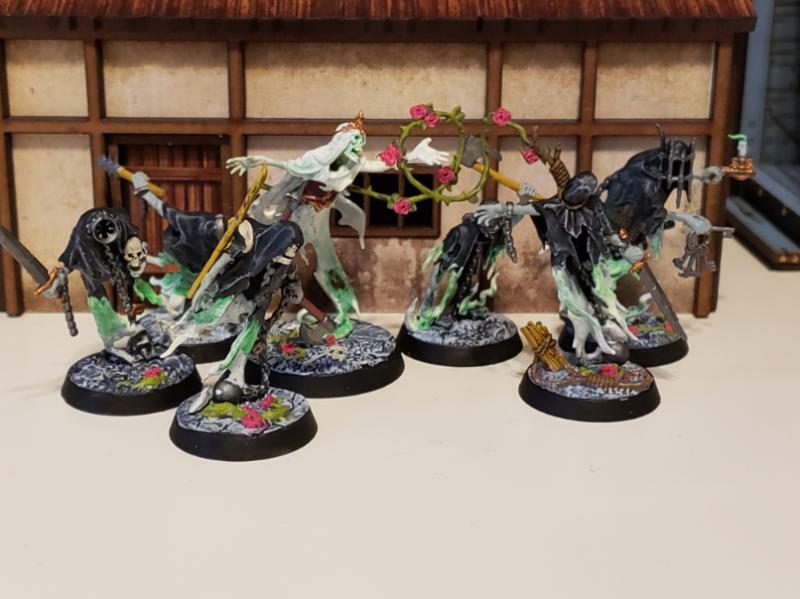 The ghosteses look good, too. I totally forgot that you got the Nightvault set. Subject: Re:Highlording it up with Highlord Tamburlaine. 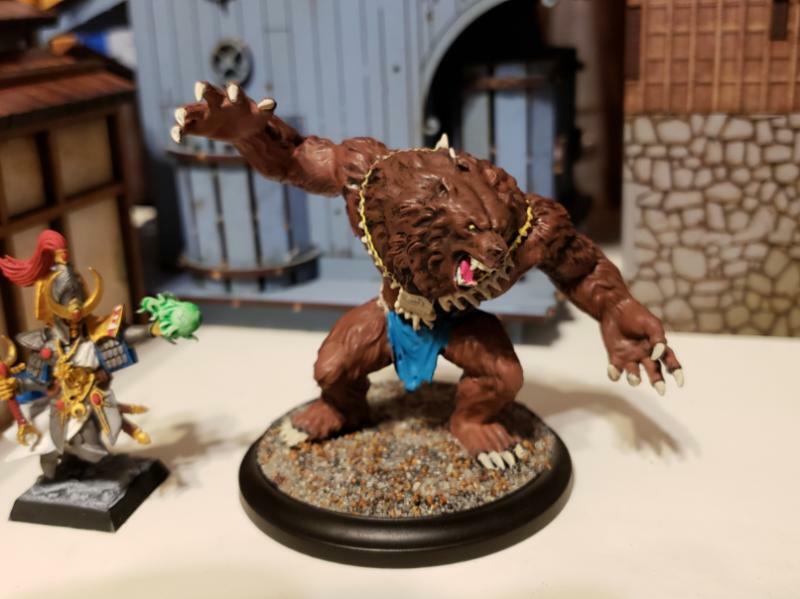 10/16 Daemons and ghosts and werebears... oh my! Also got another Darklands guy finished! Here a Fir Bholg for the Irish Erainn faction,but that, he's been enlisted under Baalor's all seeing eye now. Have to paint the Eye on his armor, or possibly tattoo it on him, but he's gone over to the bad guys team now. 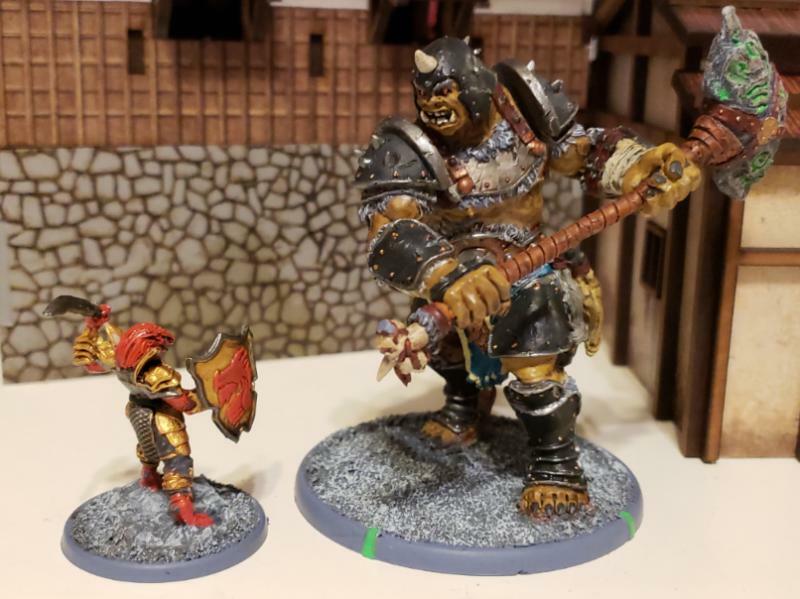 He actually fits in pretty well with my other ogres. Not nearly as armored as some of the other ones put out by Mierce. That's alright though. This is... yeah. Angry Eon. 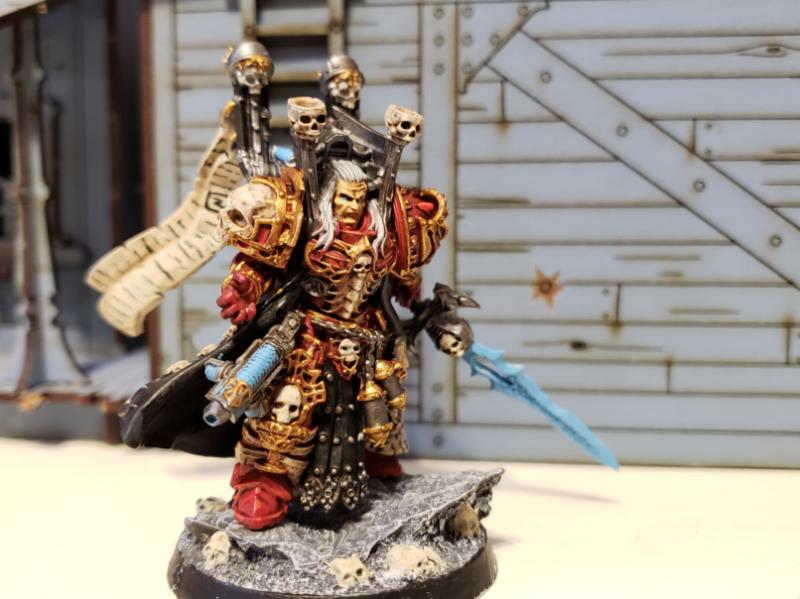 He's from Hitech Miniatures, and he's totally not Angron. Nope. He's angry. I got him cheap a couple years ago, and have broken him repeatedly and come very close to tossing him in the trash on multiple occasions. He's a lot worse for the wear and is missing multiple parts. 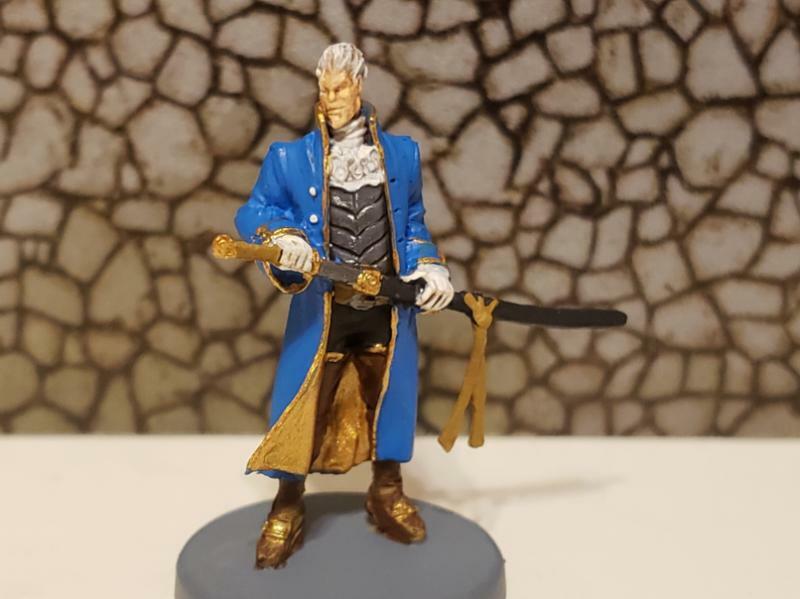 So I went and painted him now. Why? I really don't know. 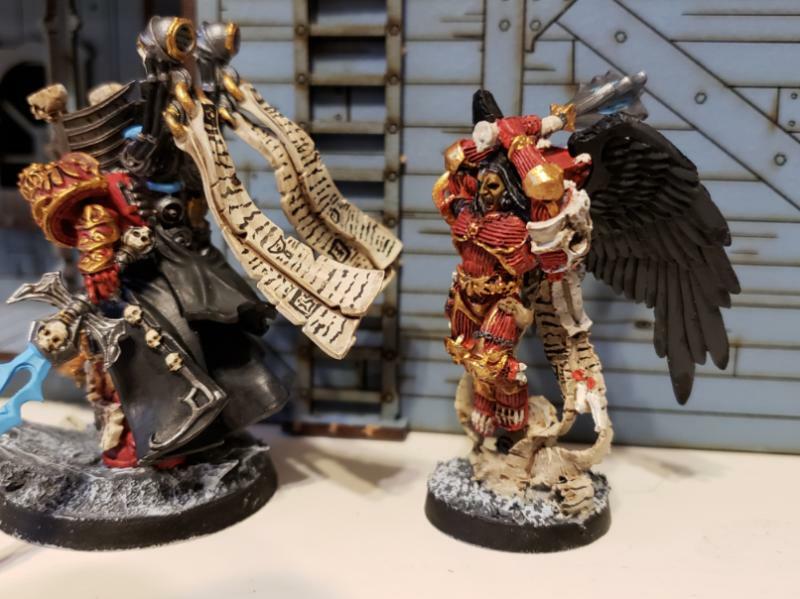 I have much cooler models in need of paint. I still need to touch up some spots on him. Eh. He'll be consignment fodder worst case, and will help pay for Blackstone fortress or whatever it'll be called when it comes out. Here's one I wasted no time getting painted. Hopefully I can take a break form eBay for a bit (made enough to mad back the Antimatter campaign and cover end of the year vacation costs) so I should hopefully get back into the groove of things! Subject: Re:Highlording it up with Highlord Tamburlaine. 10/29 A return to assorted random mini painting! Despite the crickets I shall continue to plug away. How about something you don't see every day around these here parts? 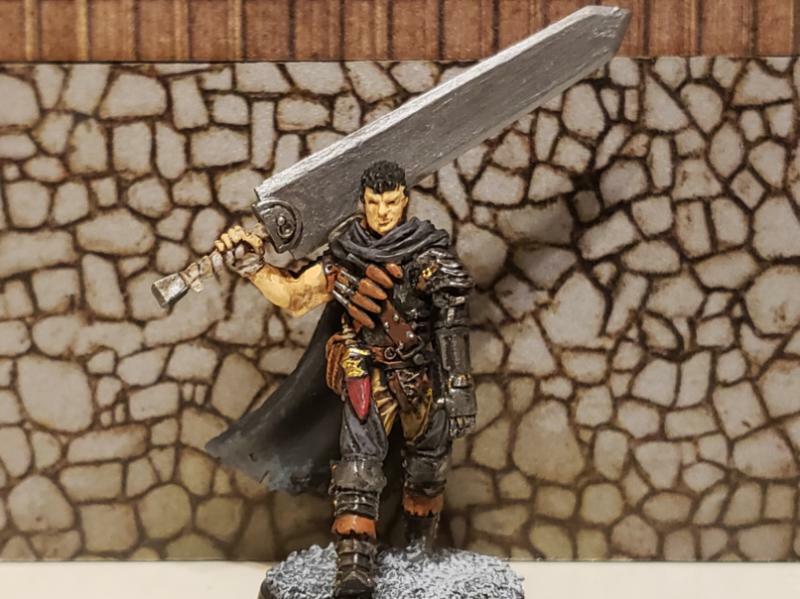 My man Guts! It's totally Guts from the manga Berserk. I forget what the figure is labeled as. 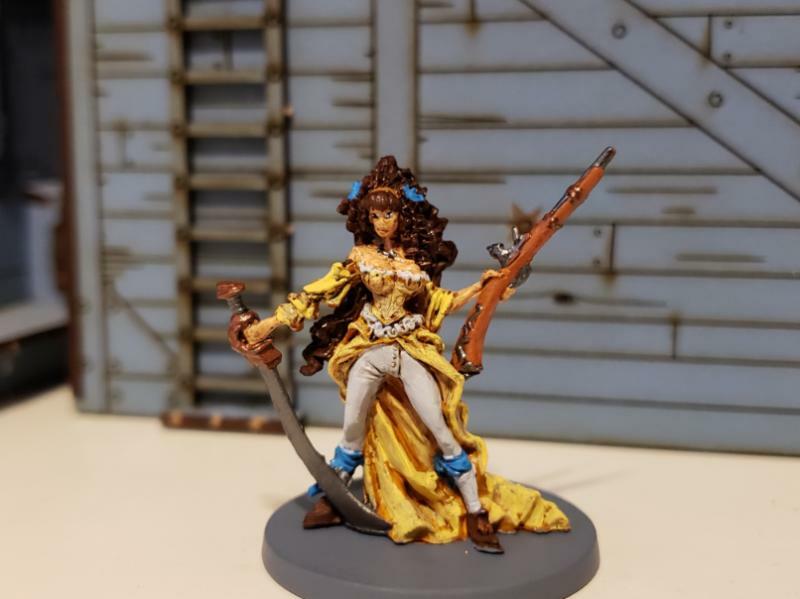 It's from Klukva miniatures in Russia. He's a good sized figure despite being squished onto a 25mm base. It was a debacle to ever receive him though. He got lost in the mail and the post office decided to send it to another city and then send it back to Russia, despite me having family contact the post office constantly about getting it (as I was in Japan at the time he was due to arrive). I did get him, and a few months later he's painted! I do need to fix up the skin tones on the arm. Not happy with them. His face is a bit ehh too, but I think part of that was due to the resin more than anything else. A random undead wraith like assassin dude from the Celtos line. I fear I made his bony parts a bit to yellow. Maybe I should go back at them with a bit of an off white? This here figure is from Rum & Bones 2nd tide. He's basically Dante from the cover of Devil May Cry 3 for all intent and purpose. I loved the Devil May Cry series. I sucked at them though. My wife actually finished the first three games while we were in college, despite her distaste of video games. And Dante is not complete without his stylish twin brother Virgil, despite both of them being proxy homage characters! They may not be the most complicated paint jobs, but these guys were pretty decent once I got past the garish board game colored plastic that's hidden under layers of paint. I'm sure these two will show up in one of our games soon enough. I keep trying to talk Barzam into trying out Sellswords & Spellslingers, an AI co-op system from Ganesha games. More than likely I can see them getting some use there. Yeah, those are definitely Dante and Virgil. Dante's missing his sports bra though. Guts came out really good and so did the ghosty guy. Nice work. More Rum and Bones. Decided to at least attempt to finish up the box that Dante and Vergil came in. 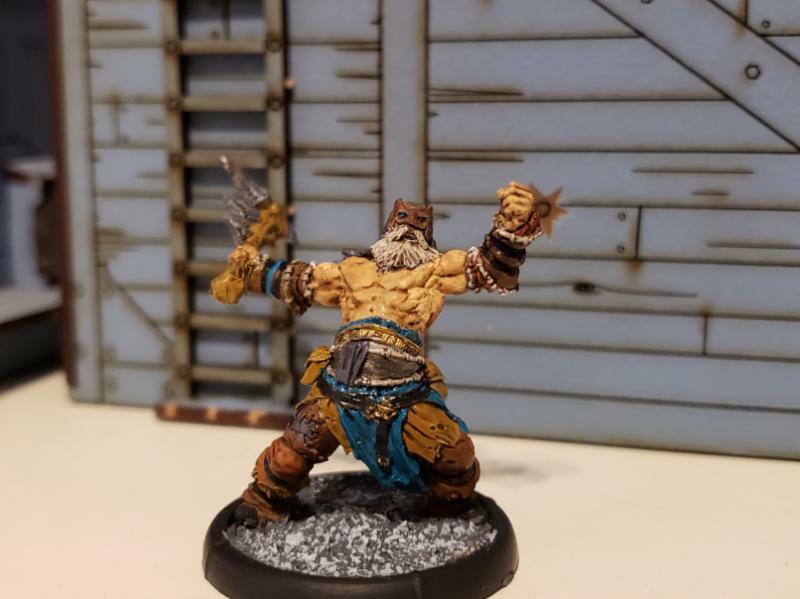 Viktor here is also a Rum and Bones mercenary figure, which means just about any team can use him if I remember correctly. He also totally looks like the hunter from Bloodborne. This isn't that surprising considering how many characters in Second Tide seemed to come from video games. 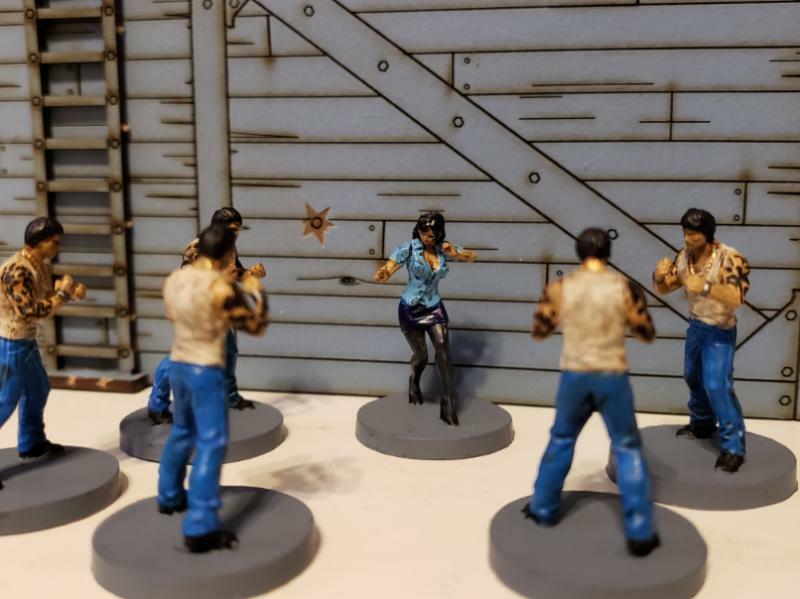 I wish they'd do this more often rather than basing things off famous people as they usually do in Zombicide. 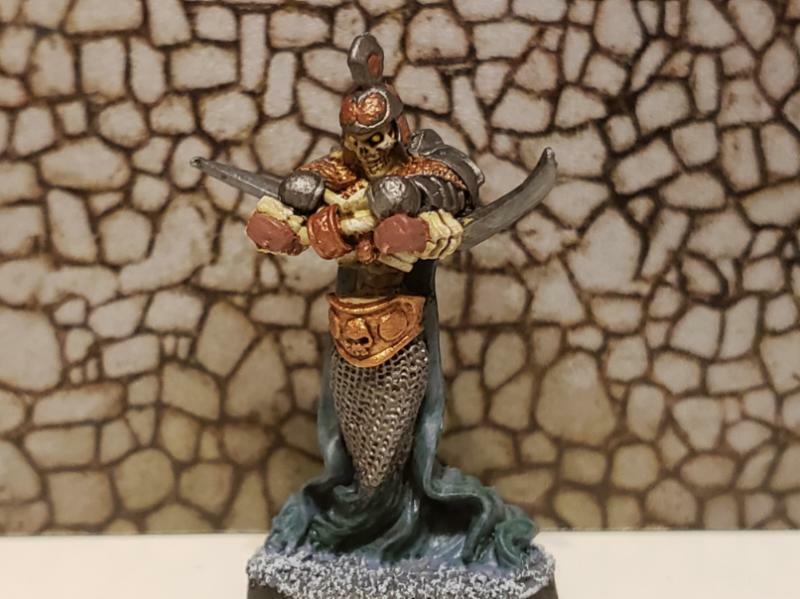 Another Rum and Bones fig. This is Belle Rose, who totally isn't based on Belle from Beauty and the Beast. I cleaned her up a bit since I took this photo. My daughter liked this figure, but she's always been a fan of beauty and the beast. The beast is also started, but I need to clear out some of the Nighthaunt units clogging up my table currently. 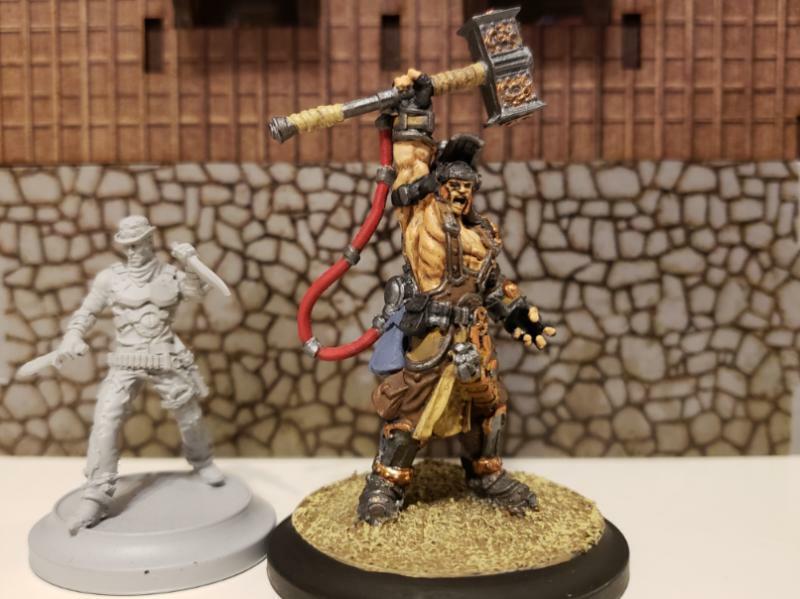 A Mutant Blacksmith ally from Shadows of Brimstone. I want to say he's either a token or a special character card you can get for an ally minion in the henchmen expansion. This was one of the resin figures on the web shop. He was a lot better casting than the original resins, that's for sure! A Fomorian Reiver guy whose name escapes me from Darklands. I don't know what his deal is. He looks nothing like the other reivers. He's got that weird batman mask, rags for clothing, and a stone/ bone club whereas everyone else has much more "modern" gear for their faction. He looks like a caveman. He's also quite short, and it doesn't help that he's lurching over. I still like him. He may get used in Paleo Diet though. 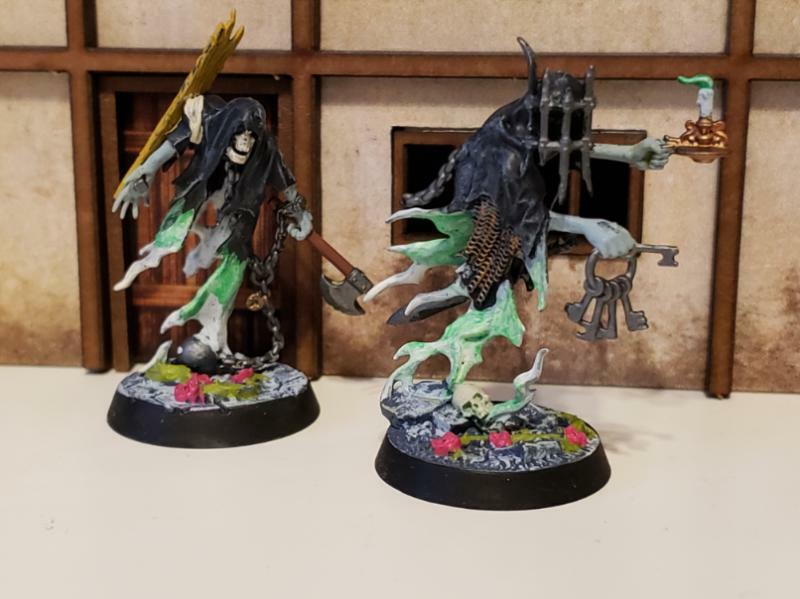 Next up- I finish my Nighthaunt army from Soul Wars! Subject: Highlording it up with Highlord Tamburlaine. 11/6 Bloodborne, Belles, Barbarians, and Blacksmiths! Are you sure that Viktor isn't supposed to be Van Helsing from the movie of the same name? I seem to recall Hugh Jackman's character dressing similarly. Plus, the crossbow. Subject: Re:Highlording it up with Highlord Tamburlaine. 11/6 Bloodborne, Belles, Barbarians, and Blacksmiths! 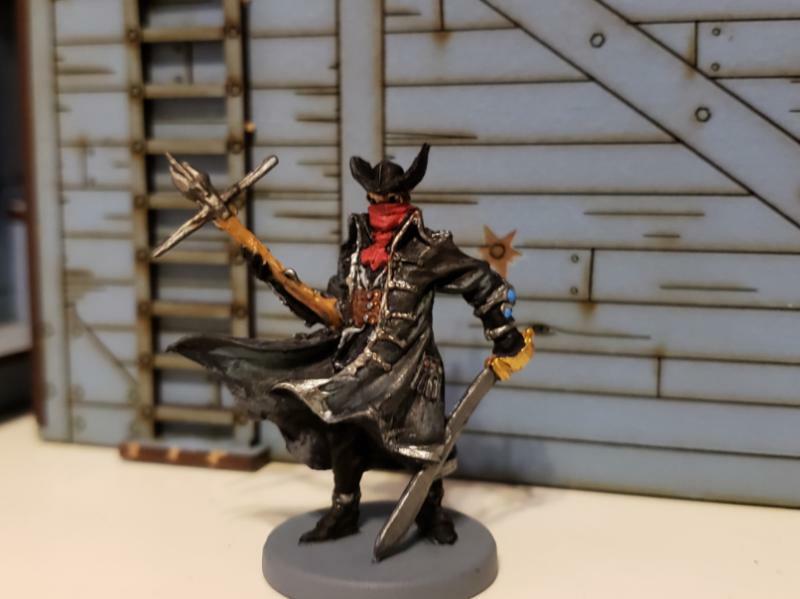 Viktor is more Bloodborne than Hugh Jackman. Time for another random assortment of stuff! 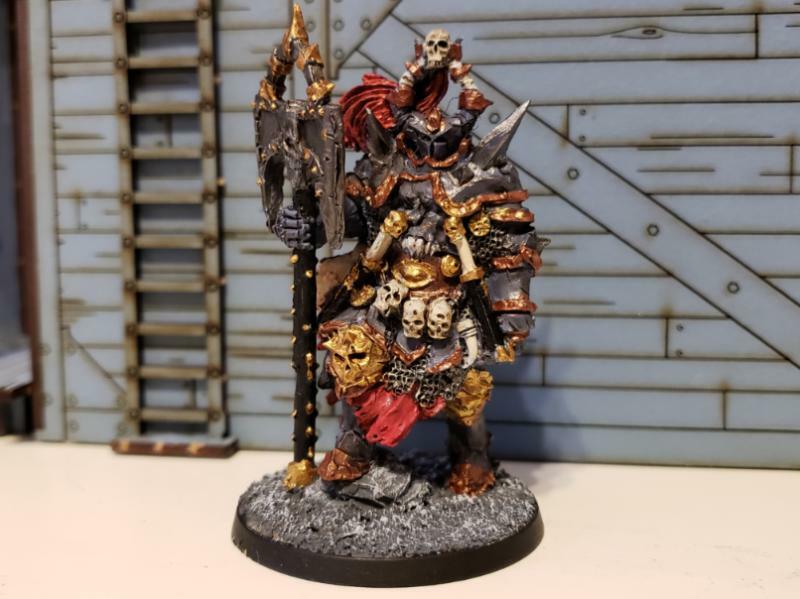 First up, the Imperial Death Lord from Wargame Exclusive/ Grimskull Miniatures! He's totally not Mephiston. Asbsolutely not. Quite enjoyed him, if it ended up a bit simplistic paint job. His scrolls turned out nice. I guess they could have been banners, but eh. 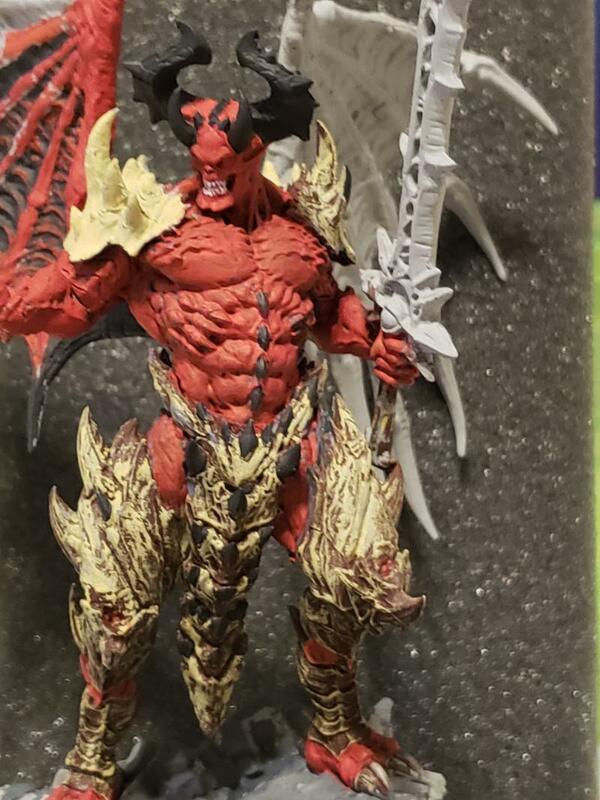 You can see the back detail on them as well as he hangs out with Astorath here. 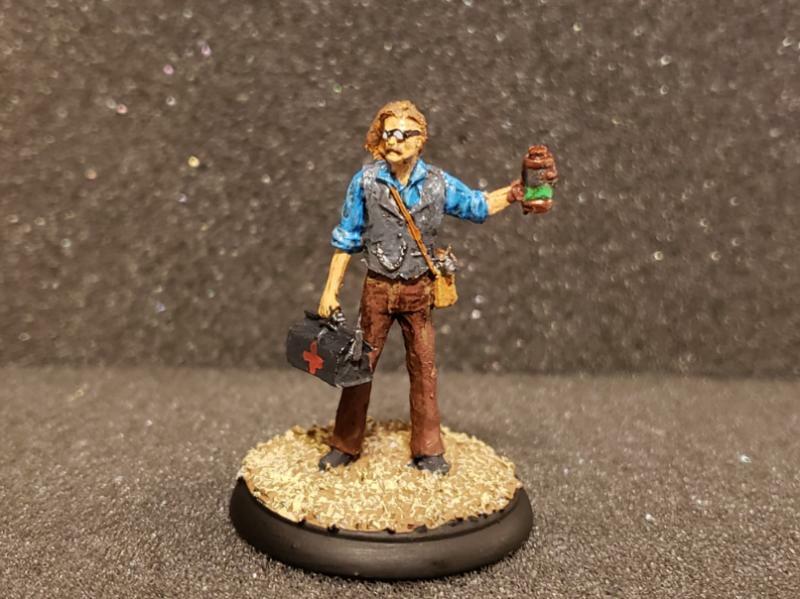 This particular guy has had a tough time, being lost, broken, paint spilled on, weapon lost and broken... yet he persevered to the point that I'm calling him done. I don't know where the mace came from that he's now carrying. The axe is lost somewhere under my desk. Never found it. Also got this guy finished up finally. I'm assuming he's some sort of Chaos Lord. He's from MOM miniaturas in Spain. The sculpt is a bit rough, but it really conveys the sense of presence I thought chaos warriors should have. He looks like something out of an early Adrian Smith design. He's also frightfully large. 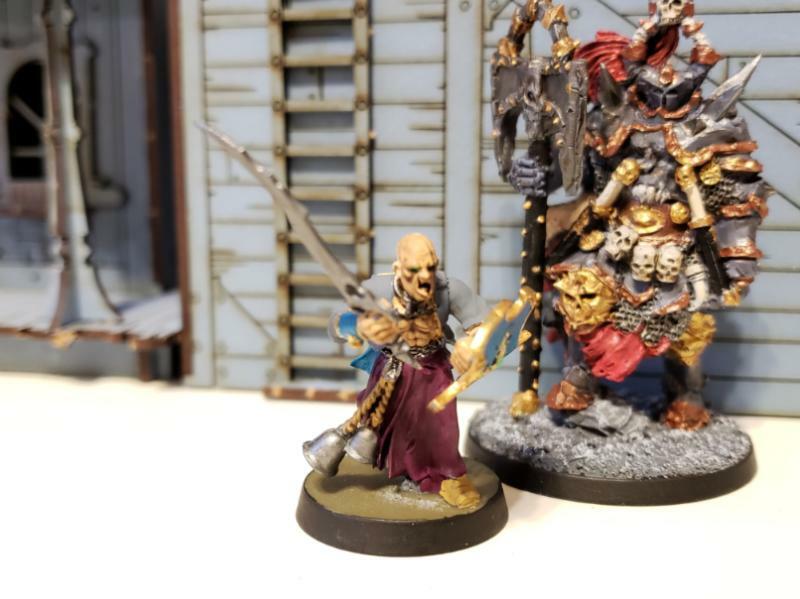 Here's a cobbled together Tzeentchian cultist hanging out with the same chaos lord, just a tiny bit in front of him. I believe he was made from a flagellant body and obviously arcanite parts. 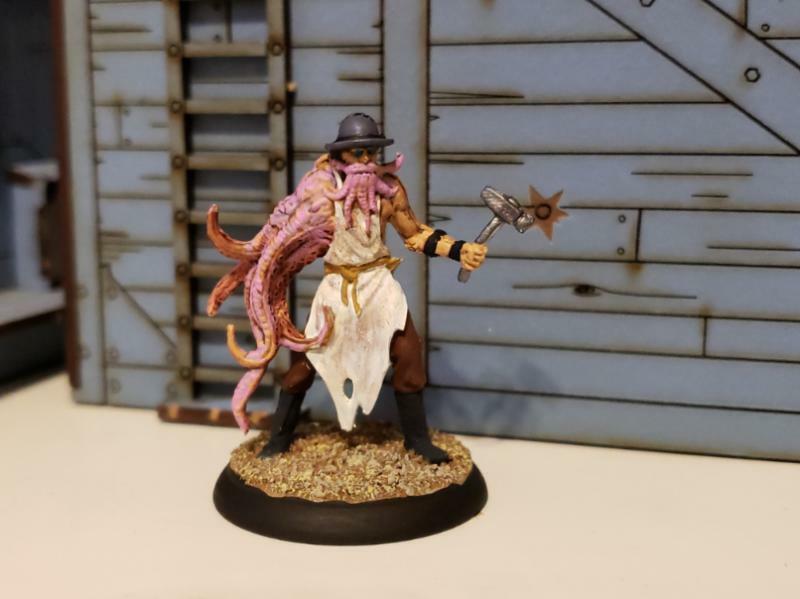 Not a bad idea for some cultists. I got a box of them for 10 bucks a while back at the hobby shop, so this guy was my test subject. 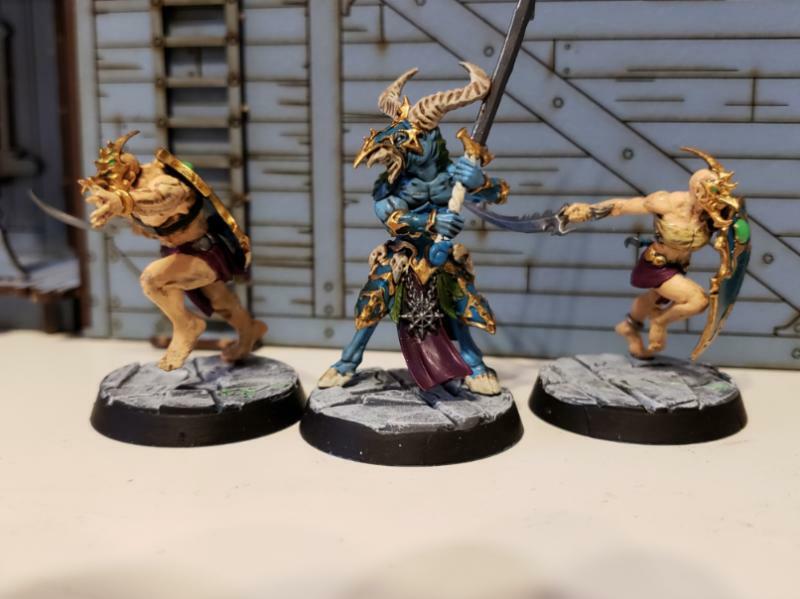 Speaking of Tzeentch, I've been making progress on my Nightvault Tzeentch warband. What I'd like to play is Street Masters. 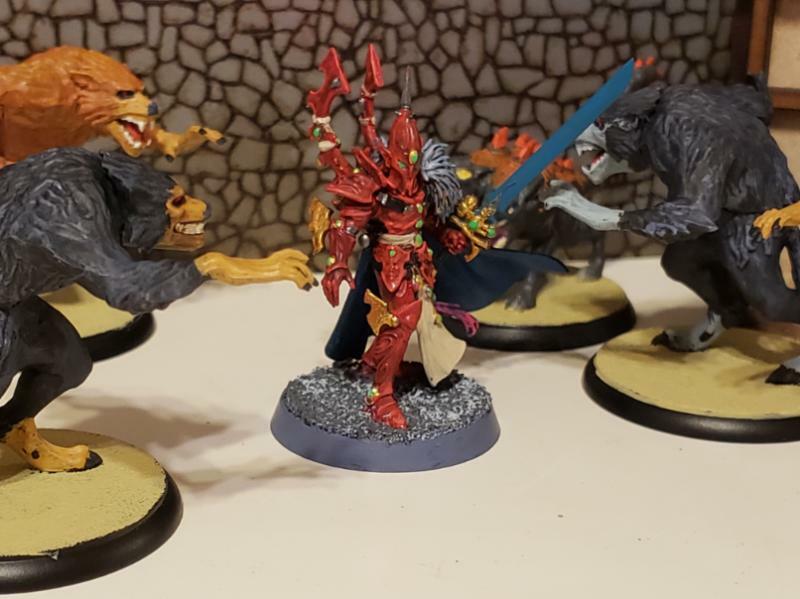 They have another campaign going on Kickstarter right now for a reprint/ expansion set, and I was quite pleased with both the game design and the figures. The new ones look even better. 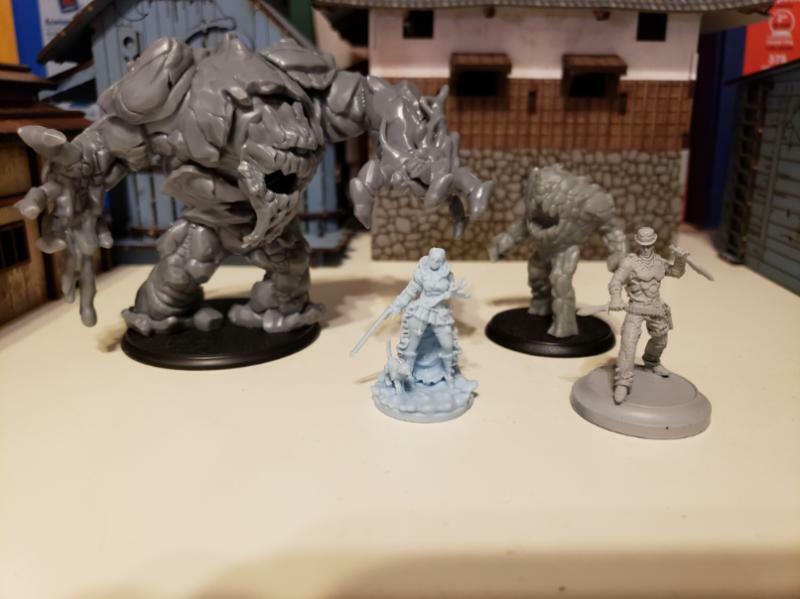 I thought I'd get it on the table this weekend, which means I need a finished set of enemies. I've painted a few from different gangs, so I grabbed the rest of the triad inspired crew and got to work on them (especially since I already started a few of their low level guys along with the main baddie being done). Their poor staves would just not straighten out no matter how much I tried hot watering them too. 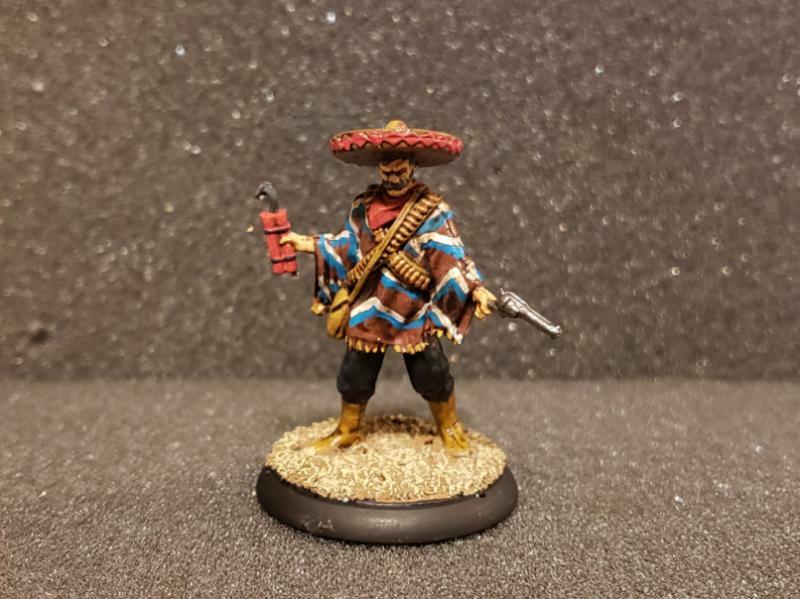 Next up I have the last hero figure I'll slap some paint on, and then it's off to either the Cartel gang or the Russians. Tough choice! Subject: Re:Highlording it up with Highlord Tamburlaine. 11/14 Sparkly Space Vampires and street fighters! ...so where'd I leave off? Being without a monitor for a while, having Dakka work blocked on all my devices (along with my email), and trying to work my way through my model backlog hasn't allowed me to post much up as often as I'd like. 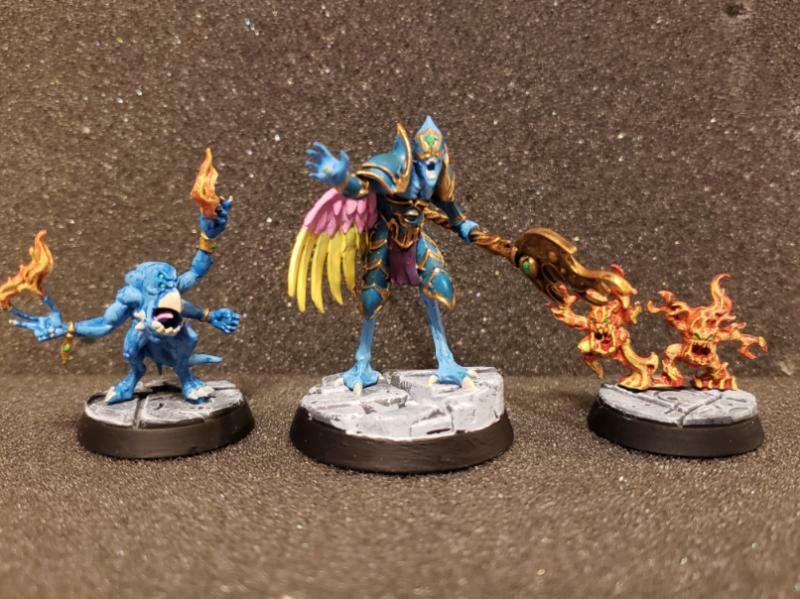 I did finish the Tzeentch Shadespire team finally. I figure they're good enough. They look presentable. I painted all that irritating Tzeentchian filigree. Now if we could just play Shadespire again! I swear it's taken a back seat over the past few months to actual wargames or Magic at my home. I'm trying to take care of all my Shadows of Brimstone backlog before Forbidden Fortress shows up. It probably doesn't help that I'm still working through the 1.5 shipping stuff from my Minecart pledge. Managed to take care of another resin guy. Jeez he's flat. I like him though. Not the greatest paint job, but not the greatest figure they've released either. 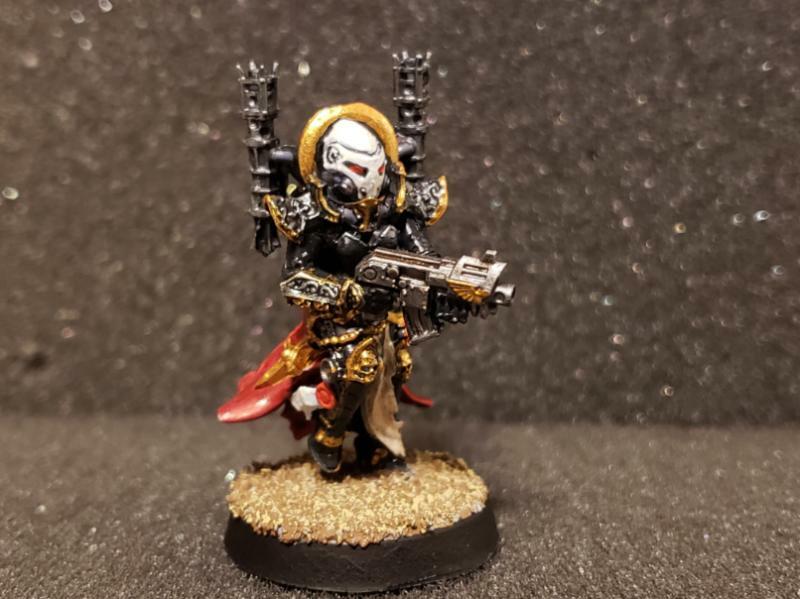 One thing I've wanted to work on are my Wargames Exclusive Sisters. I've got quite a few. Here's my first test shot. While I was working on the basic Sister, here's the Sister Repentium Mistress, as Grimskull calls her. Doesn't she run with the chainsaw ladies? I'm going to need to start working on the squad of those girls I've got as well. Her paintjob seems serviceable. I can tell what she's supposed to be. 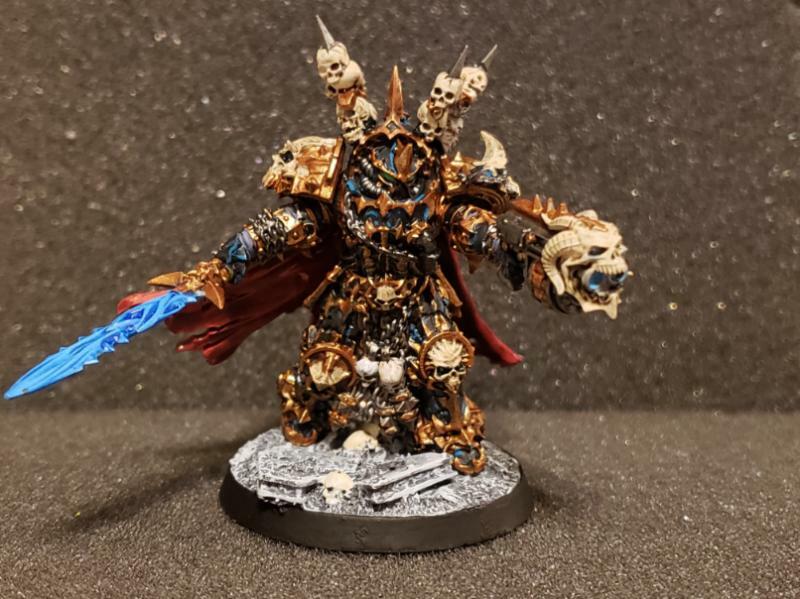 Speaking of Grimskull minis, I got the Chaos Lord guy done! I really enjoy their hero figures, even if I have no troops to go with them or no practical gaming use. He's a very busy sculpt, and it was quite difficult to figure out what's what on his armor. I think I did alright. The turquoise highlights look out of place in the photo but blended together better in person. He's a pretty reasonable size too- just a tad bit bigger than a 40k terminator suit, but not by much. 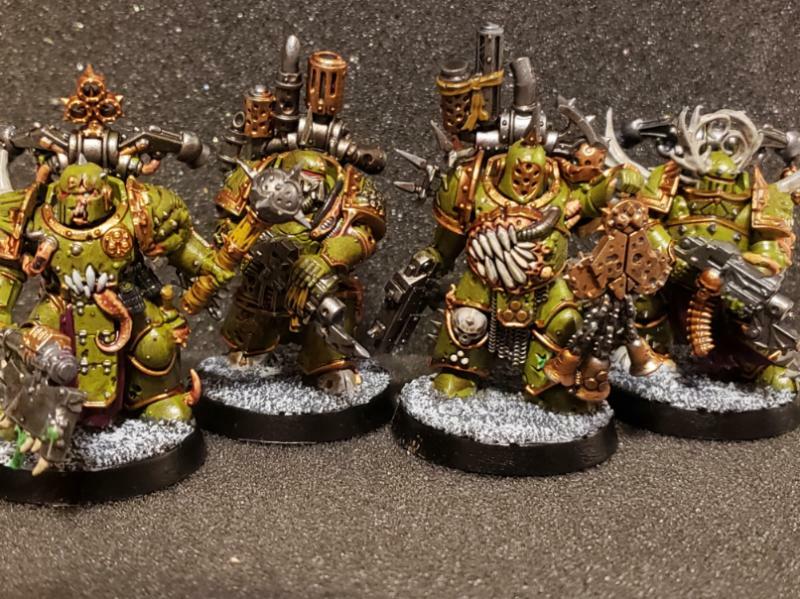 ...and speaking of Chaos, more and more Death Guard are being completed. I think these are the multipart kits. Possibly. I built a few boxes of them at the same time I built the Dark Imperium guys, and now I don't really know what's what. At least the melee guys are from the multipart box. That I know. Still quite a few to go, but it's progress! The turquoise doesn't look out of place. It looks really good and pops a lot more than other Chaos associated colors would have. Also, the Bandido looks excellent. But please tell us more about how you got Dakka blocked at work. 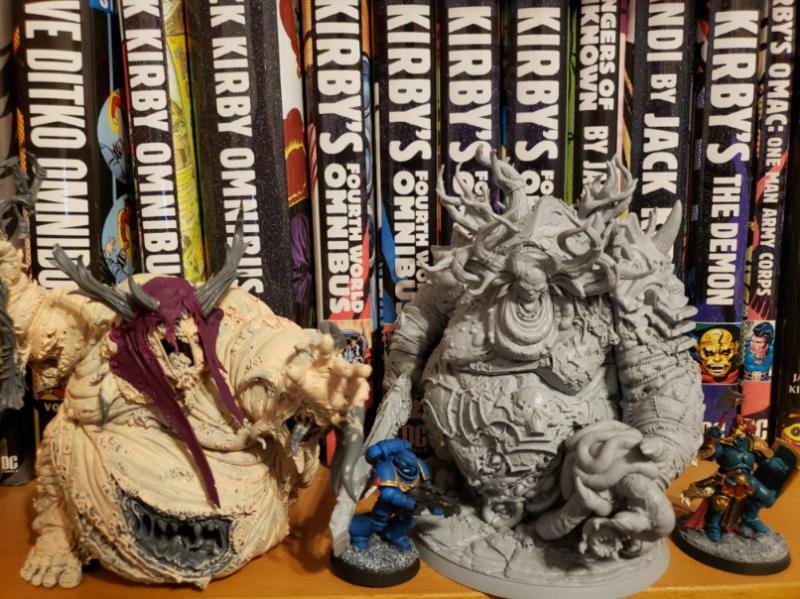 Did you get caught looking at Kingdom Death? Holy cow, the painting on that serape is fantastic- well done! _Love_ the street fighting scenes- takes me back to bad (meaning really, really, good) kung-fu movies on Saturday morning.